Welcome back! Or should it be you welcoming me back? Anyway, time for another instalment. Nearly a year has passed since the last update, and whilst the outside of the house has changed little (with one important exception – see later), the inside has undergone a bit of a transformation. 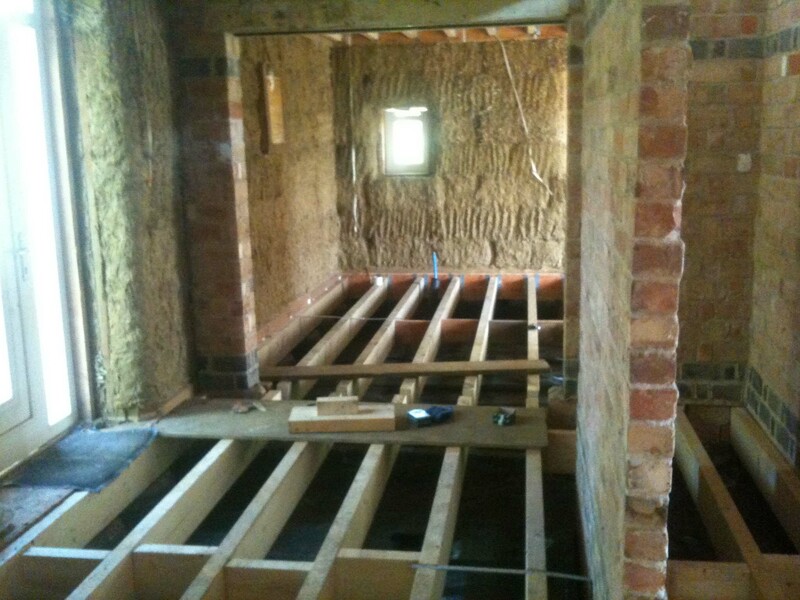 Last we spoke, I detailed how we had installed most of the joists throughout the house.The next step was to put some netting under the ground floor joists, to support the floor insulation, but also allow it to breathe. 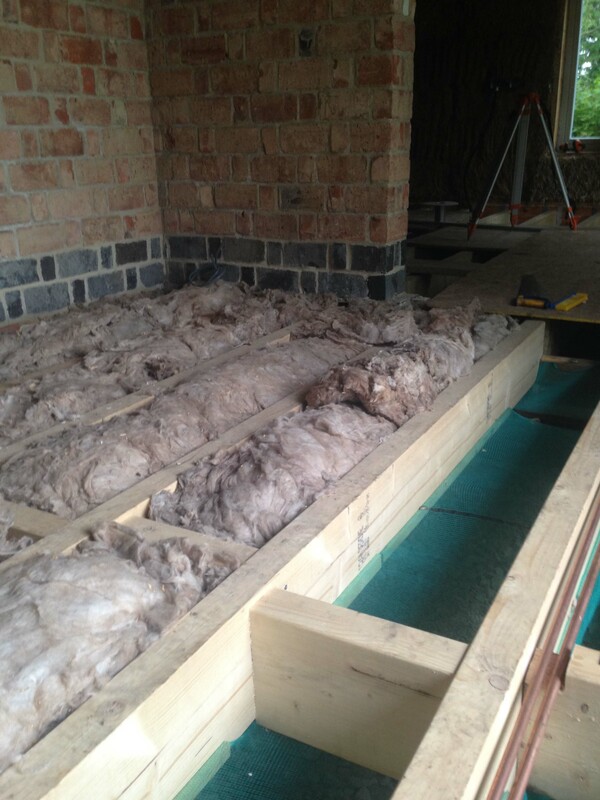 Its important to make sure there is enough airflow under the floor, and to the underside of the insulation, so there is no build up of moisture around the joists. 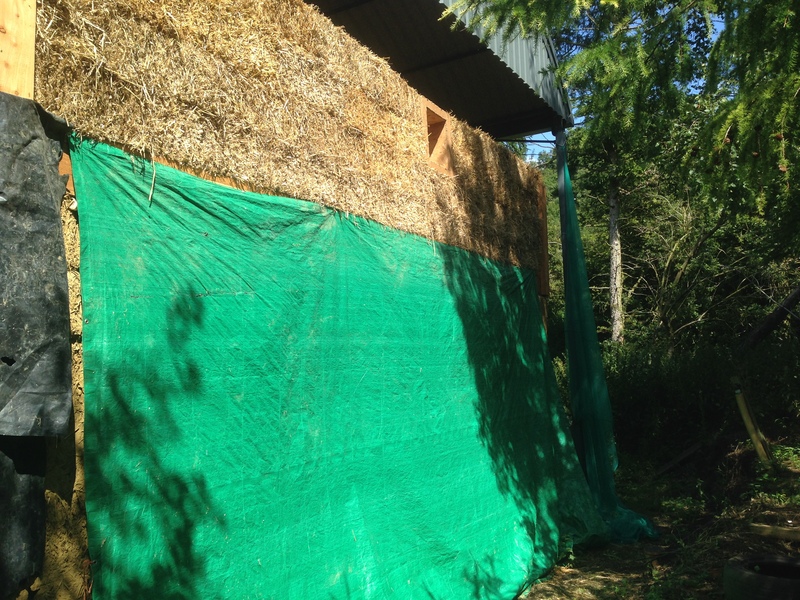 We used left over debris netting, that we’d bought to try to keep the worst of the weather off the straw walls whilst building them (which didn’t work!). 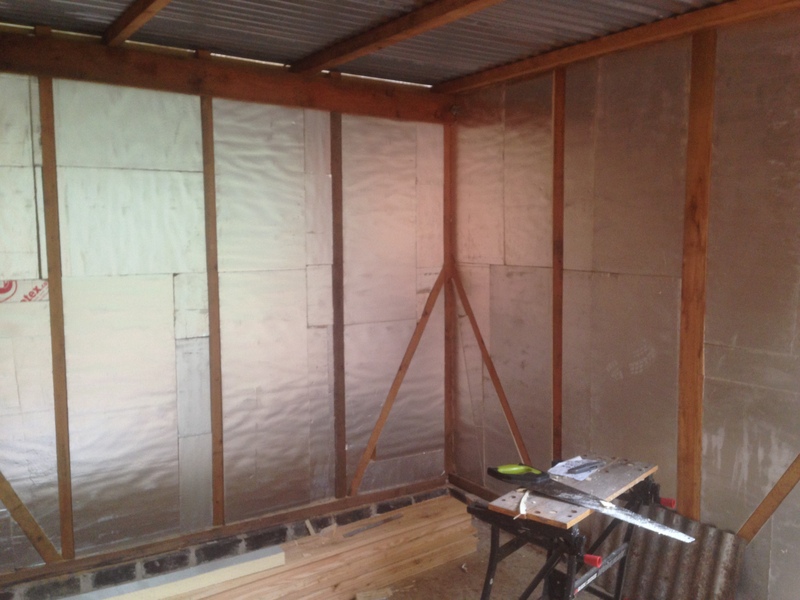 Our insulation is made up of reclaimed rock-wool from demolitions. This covered about half the ground floor. 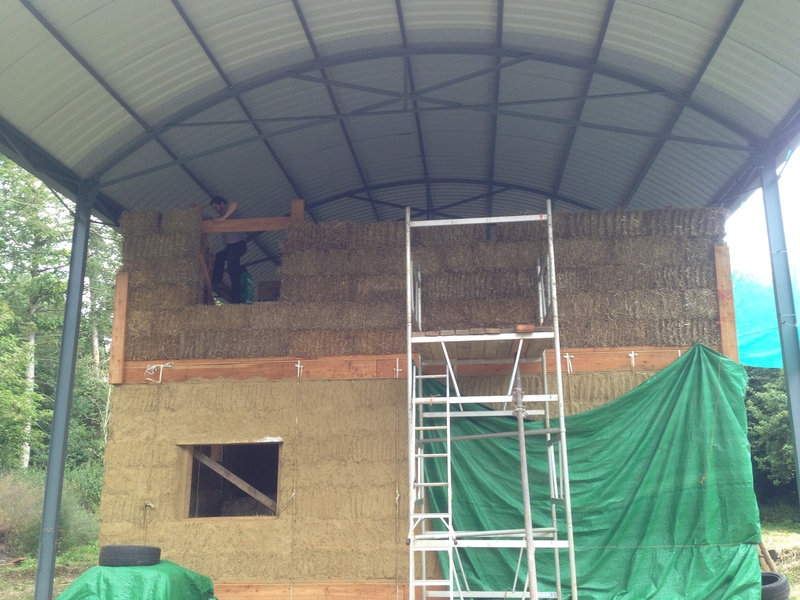 The rest was done with new rock-wool – to a depth of 250mm. 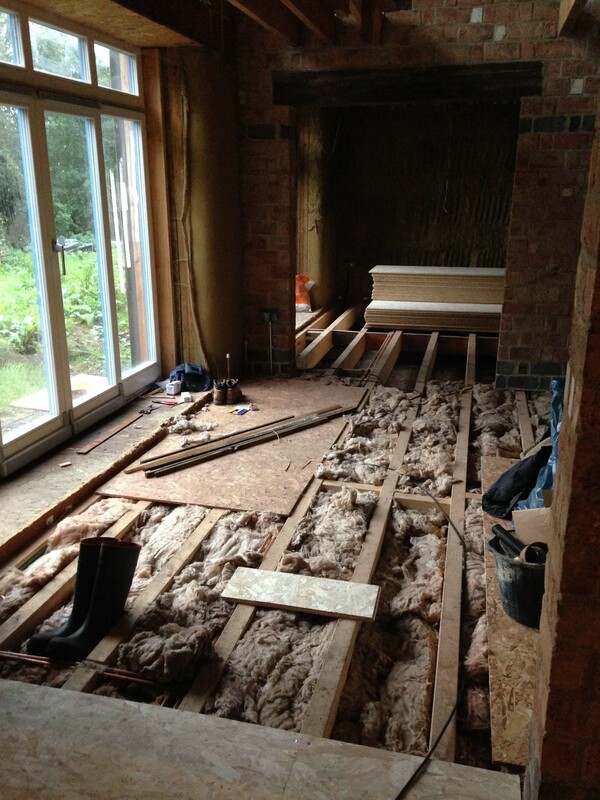 Once this was done, the first fix of both the electrics and plumbing could commence, so that we could think about laying the floors. 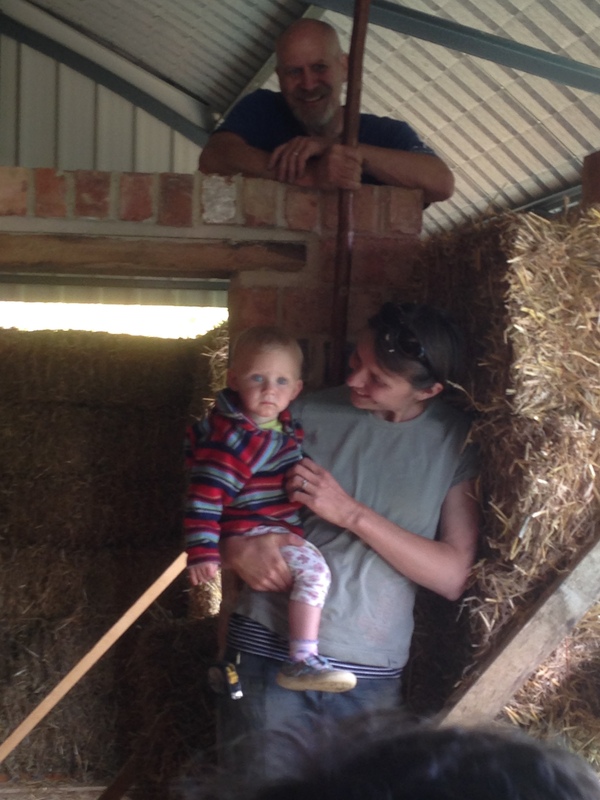 spring, Liam and Dave (plumber) came to check out the job, and in the first week in June, they both spent four days putting in the bulk of the heating/water pipes and electrics. 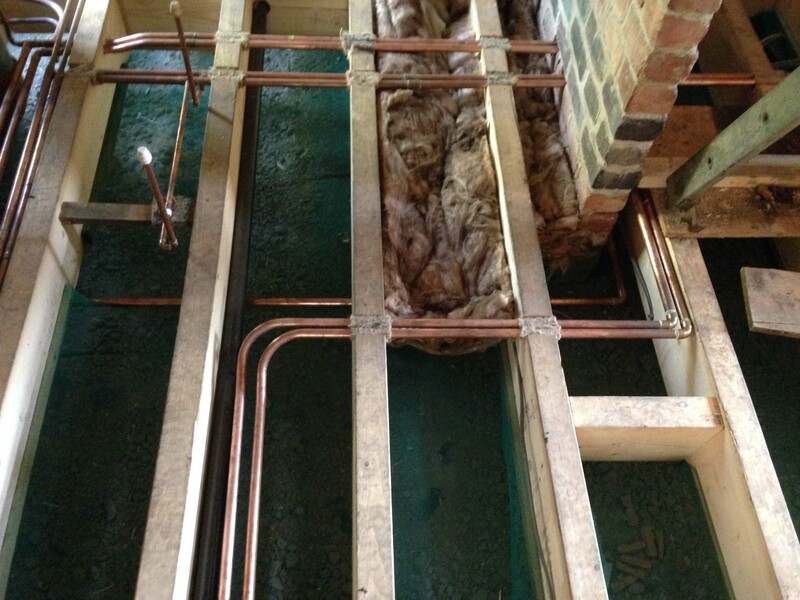 Both systems at this level are fairly standard, with the pipes in copper, and the wiring running in nice industrial looking conduit over the brick walls, and in plastic trunking chased into the straw walls. Wiring and pipes in, we could start to lay the ground floor floorboards. 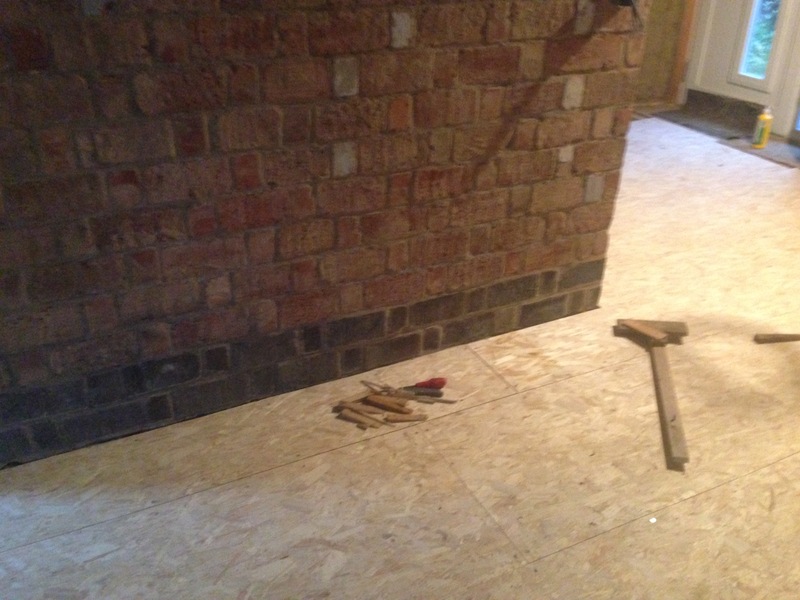 This was a nice swift job, and in no time at all we had a smart tongue and groove OSB floor – no more slipping off the joists! 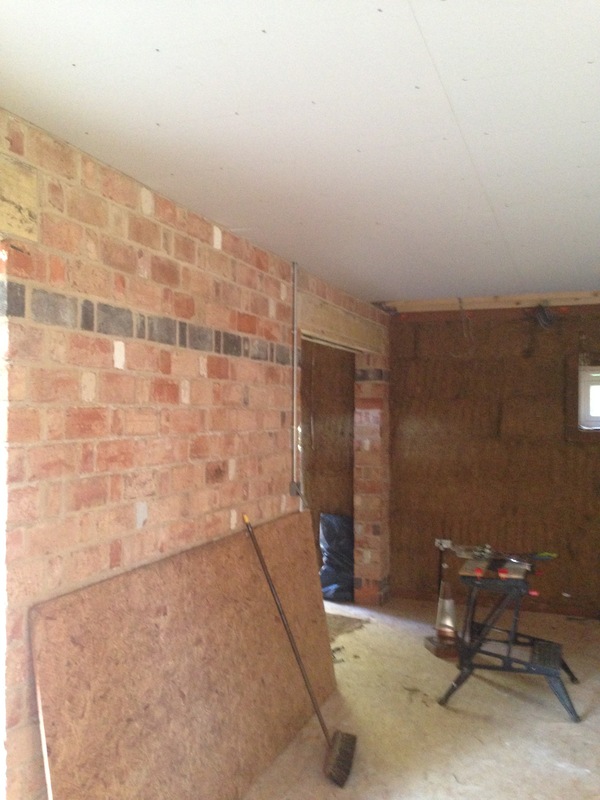 Now we could start working our way up the house – next job the ground floor ceiling – another bog-standard job, 12.5mm plasterboard. 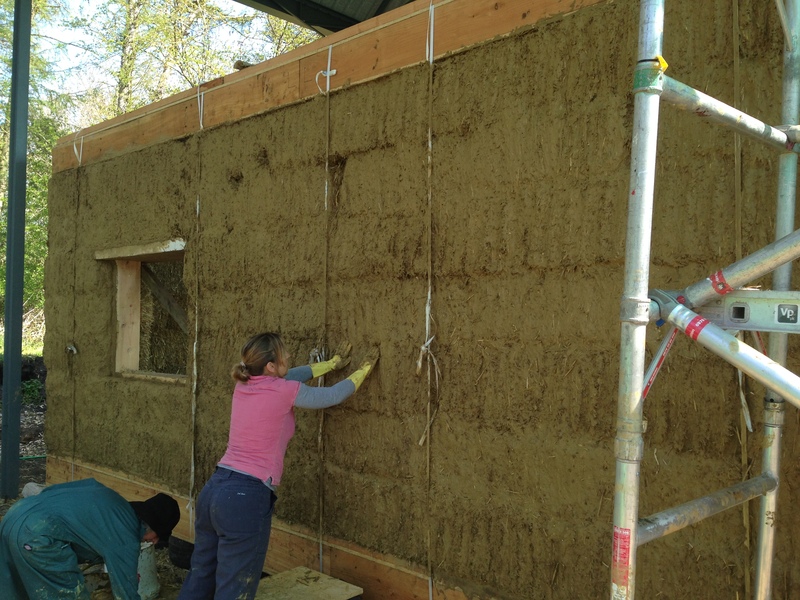 For the sake of time and cost, we had to sacrifice a small bit of our carbon gains for high footprint gypsum – still its easy to install. 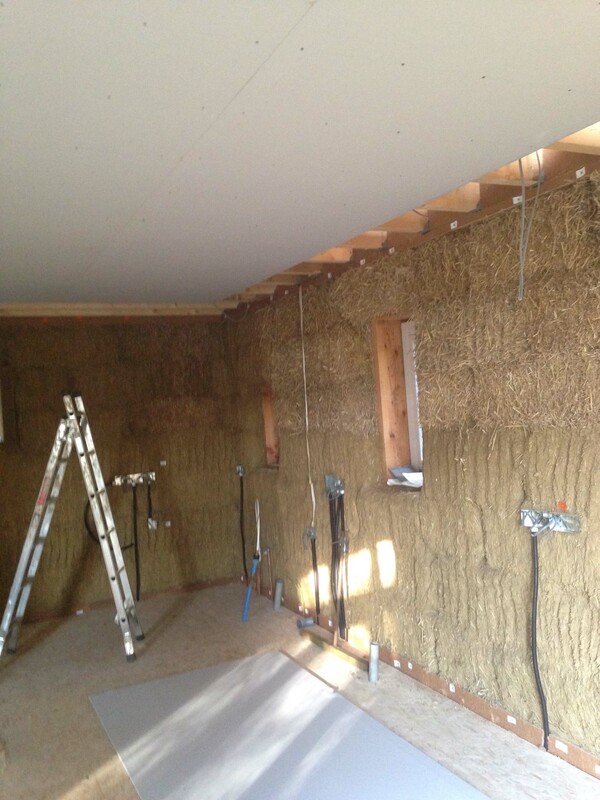 First ceiling in place, we moved upstairs to start insulating the first floor and boarding that out. 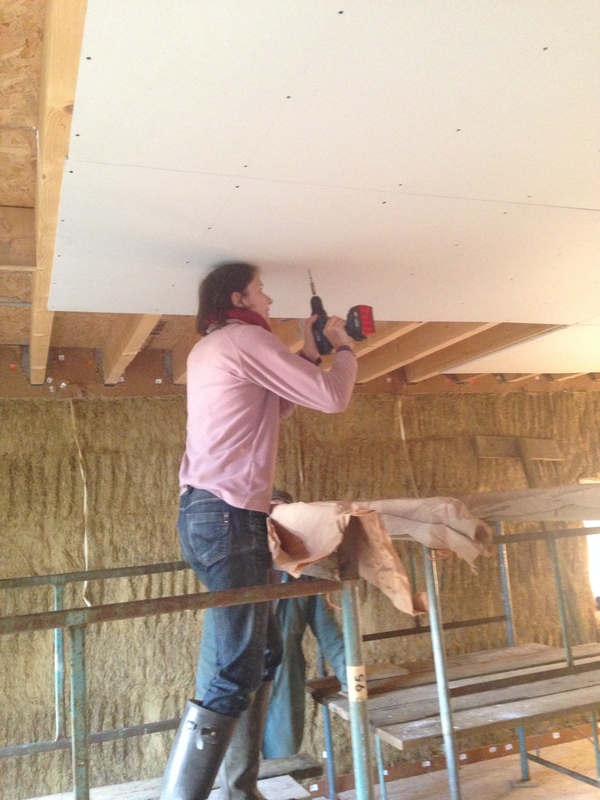 This gave us a stable platform to plasterboard the upstairs ceiling. 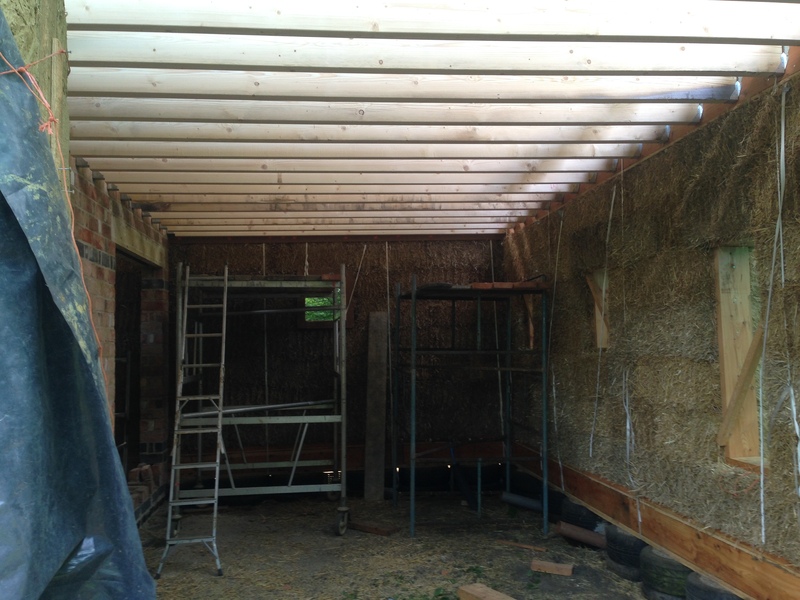 And thence to the roof space…and a layer of insulation, plus a lot of air-tightness tape. 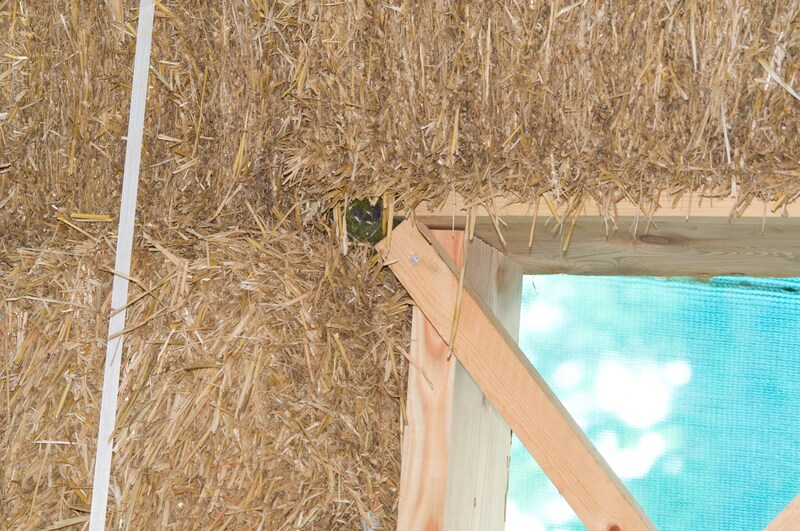 The key to good thermal performance is not only the thickness and effectiveness of the insulation, but also reduction of drafts. 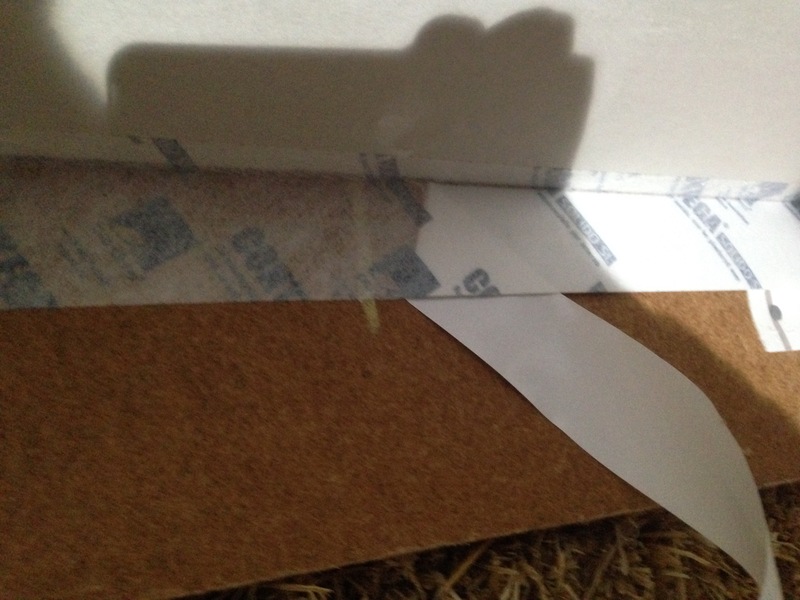 To this end, we need to seal the thermal envelope (the inside of the house) from the outside. 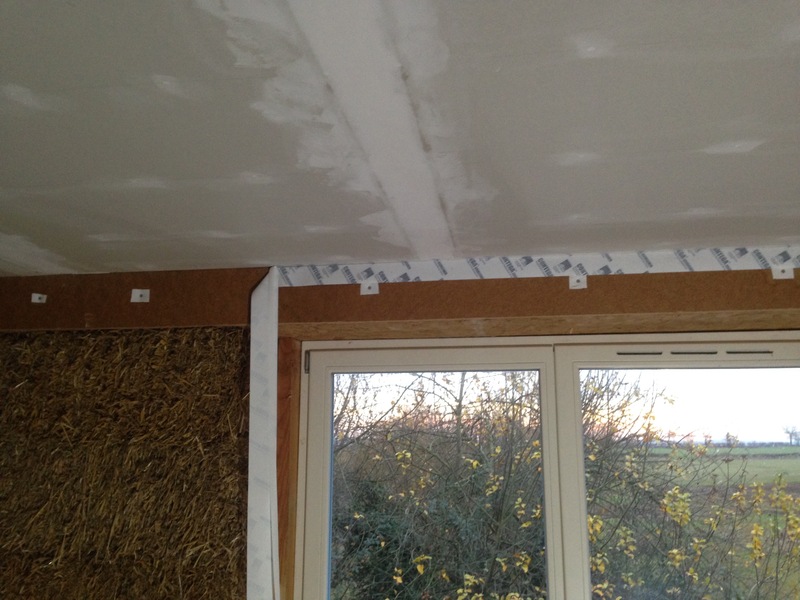 To do this we used specialist air-tightness tape – on the face of it, very expensive. 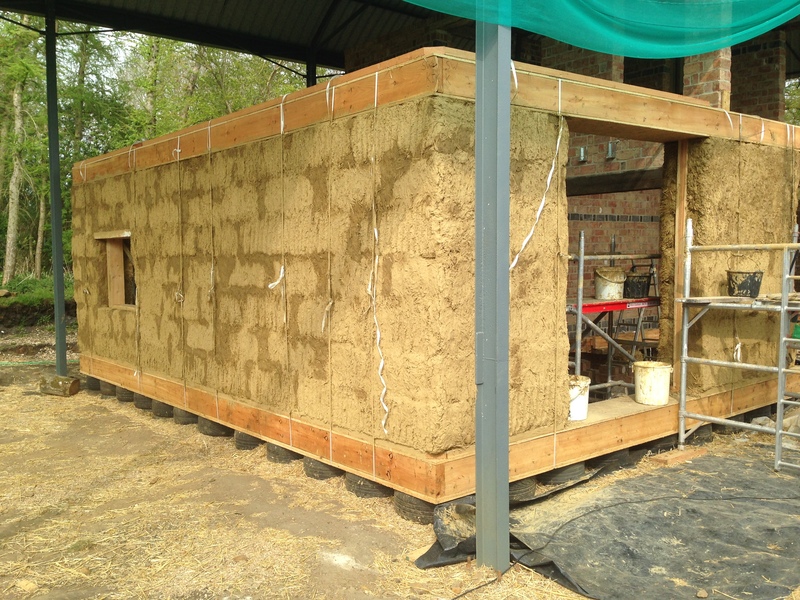 However, it sticks to all sorts of surfaces – like dry clay plaster, wood and bricks, making it very effective. 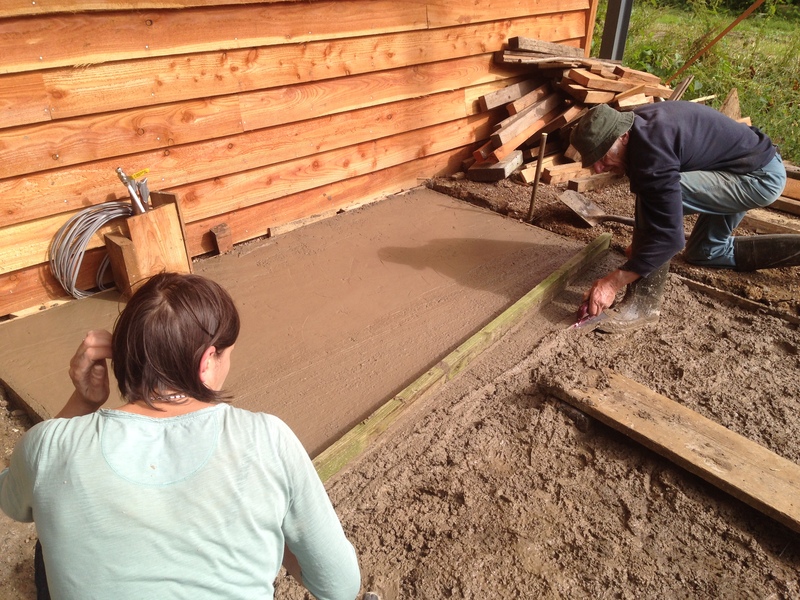 Now, a quick trip back in time…..in mid-summer, before we headed off for a month’s sabbatical in the western isles (someone’s got to do it…) we started to prepare the ground outside the house for the laying of the concrete base for the boiler house. 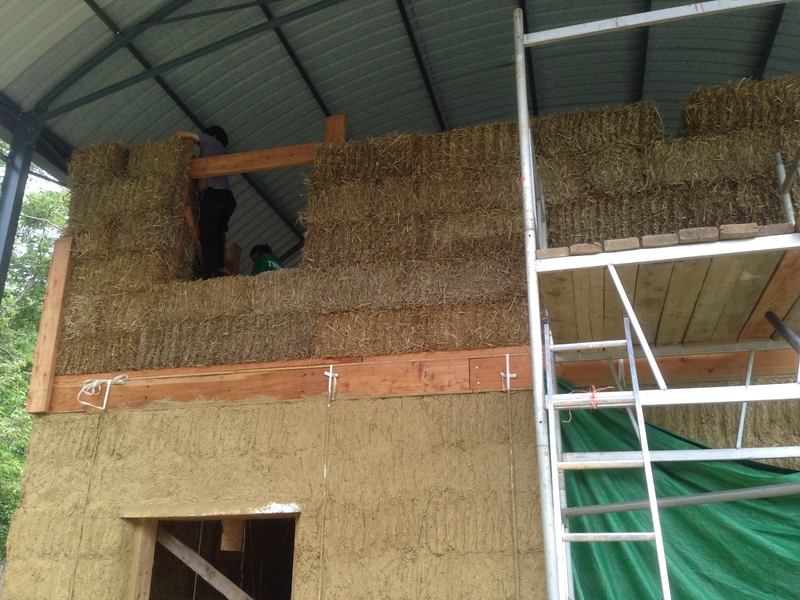 In keeping with the construction of the house, and the use of solar panels for electricity generation, we planned to heat the house using locally sourced biomass. 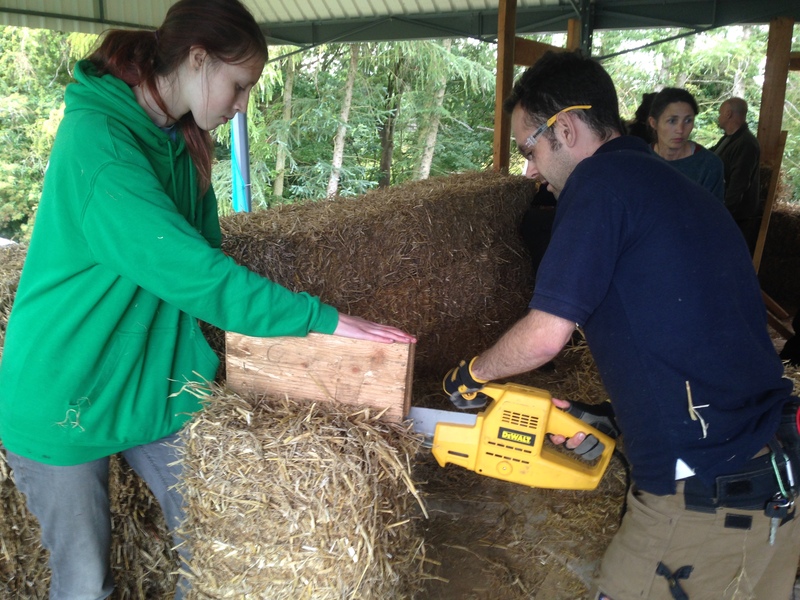 In our case, this will be logs from the management of hedges and woodland on the farm (coppicing and hedge-laying). This boiler is to be housed outside the house, as it requires a 1500litre accumulator tank, to store heat from log burning. 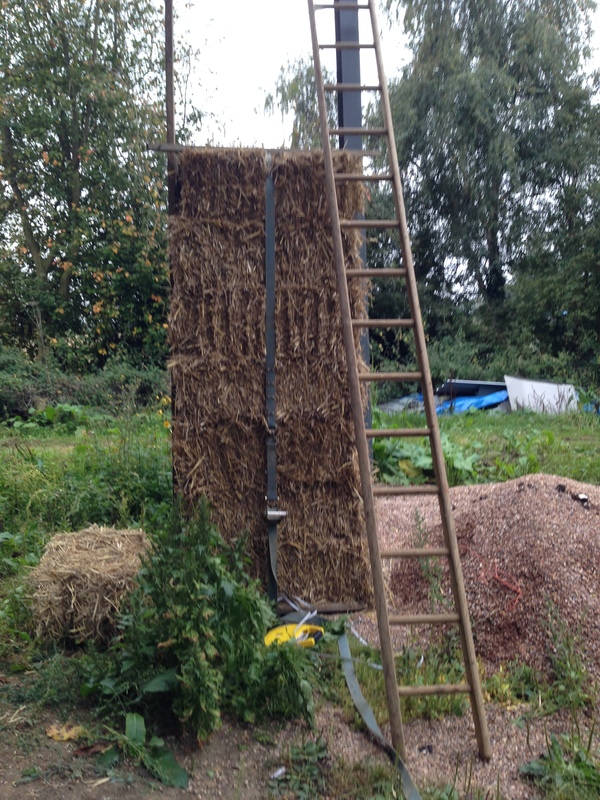 To this end, we needed to lay a solid plinth capable of supporting over two tonnes of water and boiler. 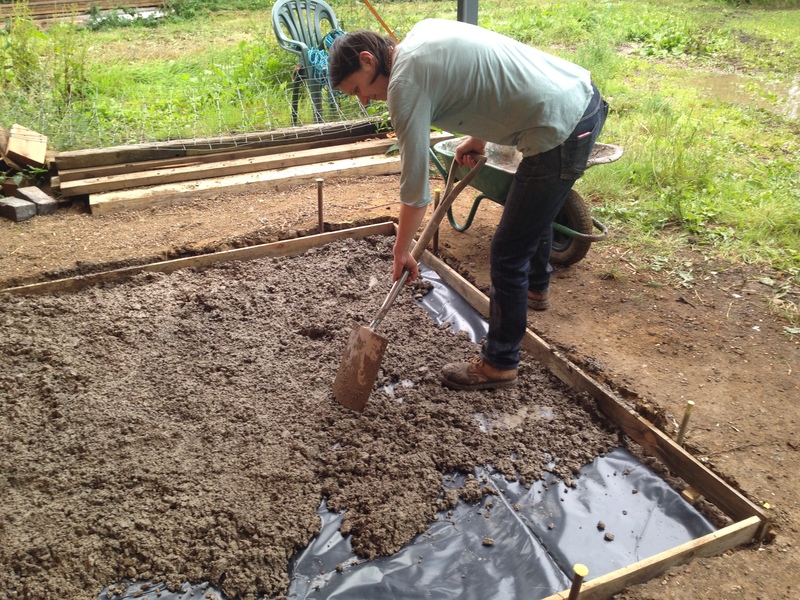 Therefore, we decided to resort to concrete – resilient, easy to lay and reinforceable. 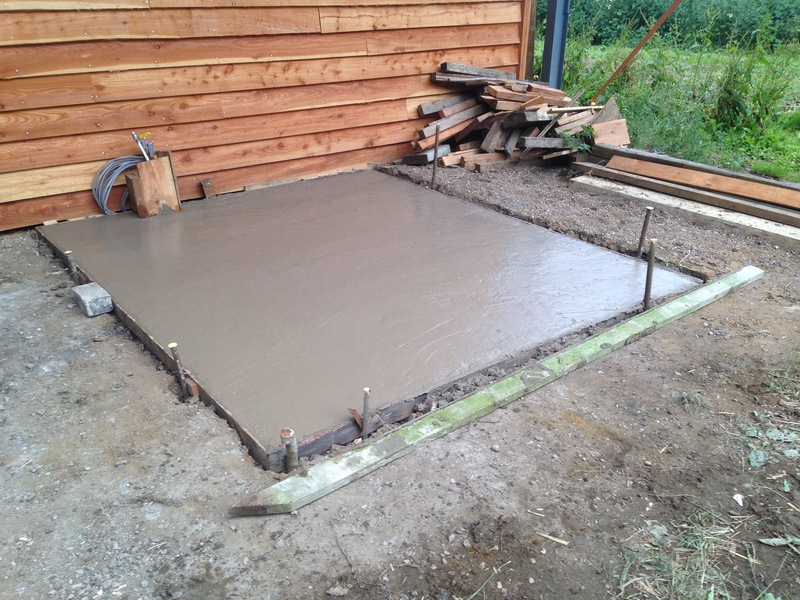 On our return from the north, we built the boiler house over this concrete slab, over the course of a couple of weekends. 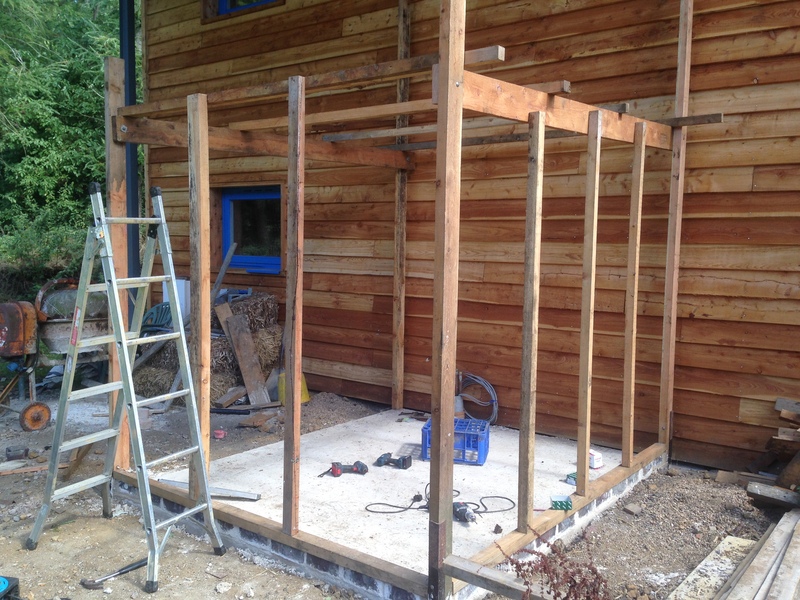 A robust frame (hopefully one day to support a deck, for sunbathing on rainy days!) 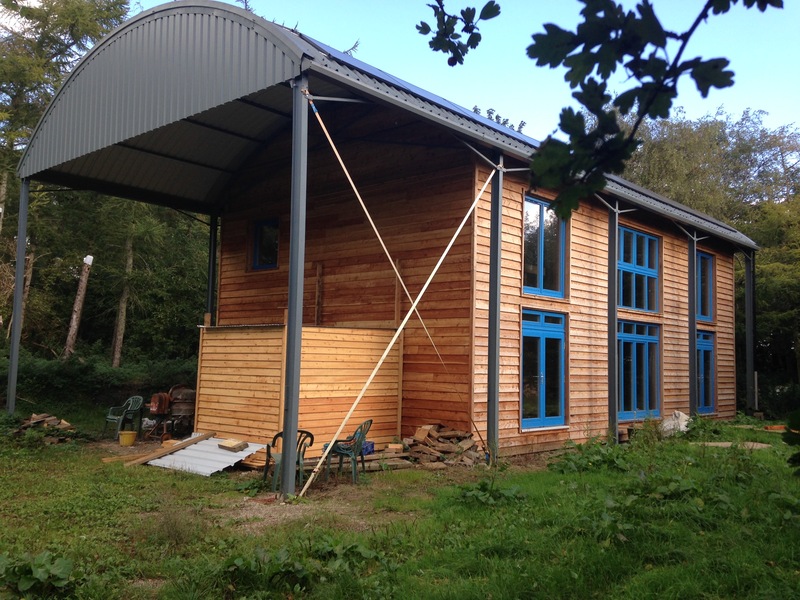 clad with larch, lined with rigid foam insulation and under a tin roof. 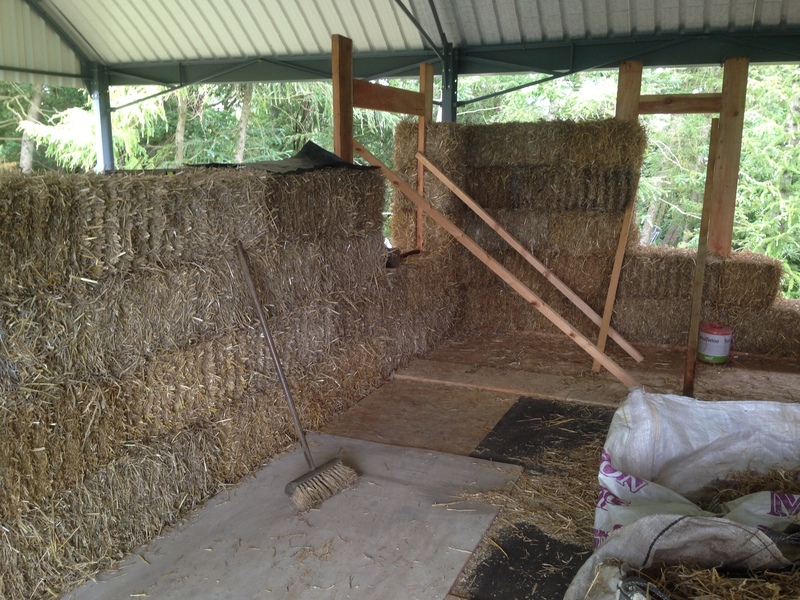 Right, back to now, or then……anyway, once the ceilings and floors were finished, we could start with the last remaining big job – plastering the straw walls. We recruited more help – Archie (my nephew, and all round handy man, rock fan and young person) was signed up as regular Saturday worker, Kev and Anna proved able and willing for big plastering days, and Thom provided invaluable help and support over the festive period. I experimented and got a plaster preparation routine sorted using the venerable cement mixer. We got better at it! 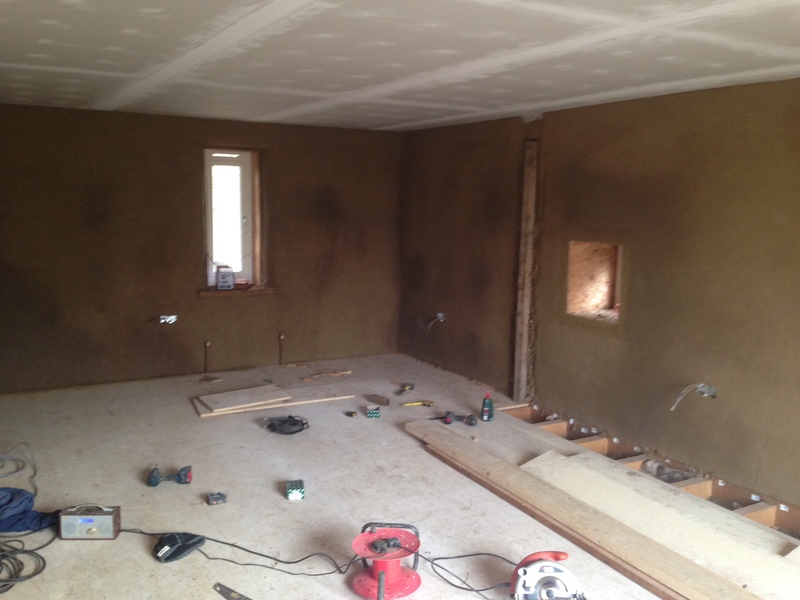 As I write this at the end of February, the bulk of the internal plastering is finished, leaving the internal walls covered in a lovely, warm-feeling organic looking covering. Its still a bit too brown, but painting with light coloured breathable paints should help with that. We’re now building partition walls to get the finished layout of rooms, and about to tackle installing the stairs….More on that soon. 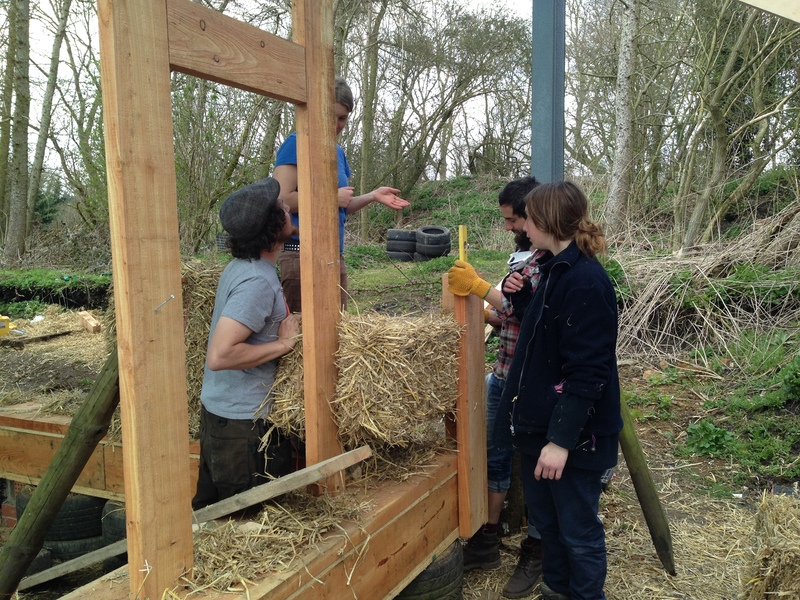 A huge thanks to all who have helped with this stage of the work – it was a massive, labour-intensive job that we couldn’t have done without you! Muddy respect! This entry was posted in Uncategorized on February 21, 2017 by scampifield. You thought the last interlude was long, well try 5 months. But we haven’t been wasting our time since then. 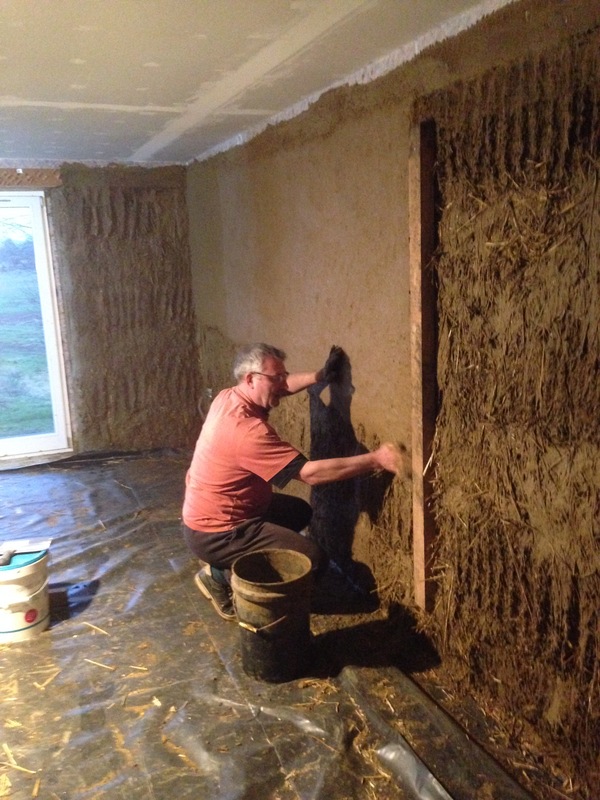 Before Christmas, we completed the plastering of the outside of the house, with the help of ‘Helper Dave’ and family, and apart from a bit of inside plastering, thoughts turned to cladding. 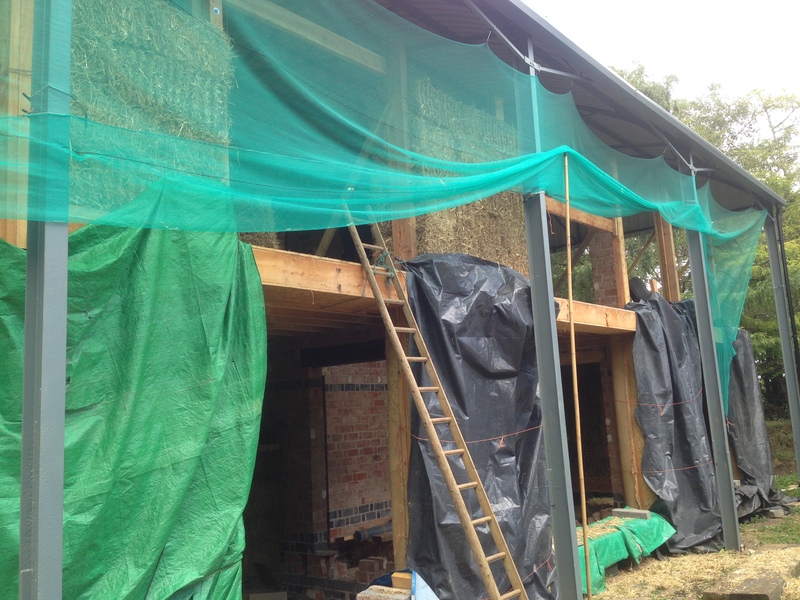 In the weeks leading up to Christmas, Jamie Duffin and his gang of chippies began the job of putting on the cladding. 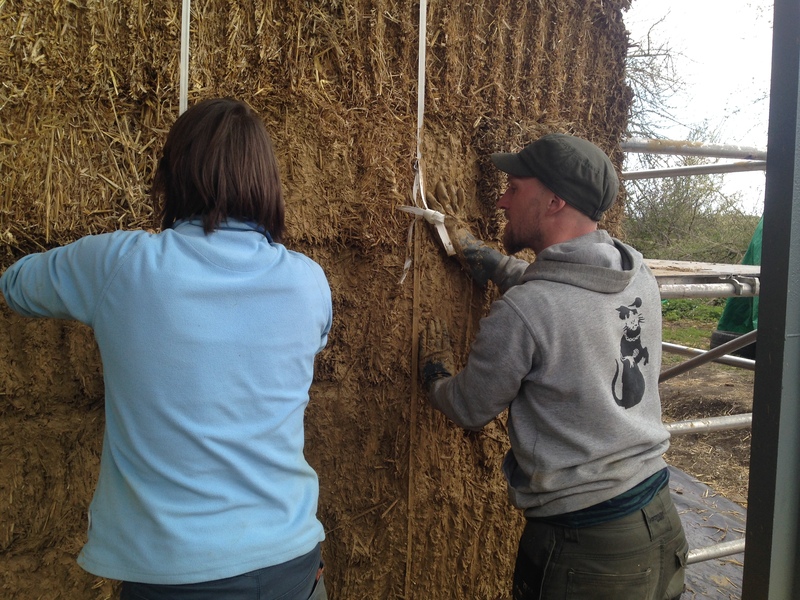 Originally, we had planned to be a bit more traditional, and plaster the external straw with lime mortar. 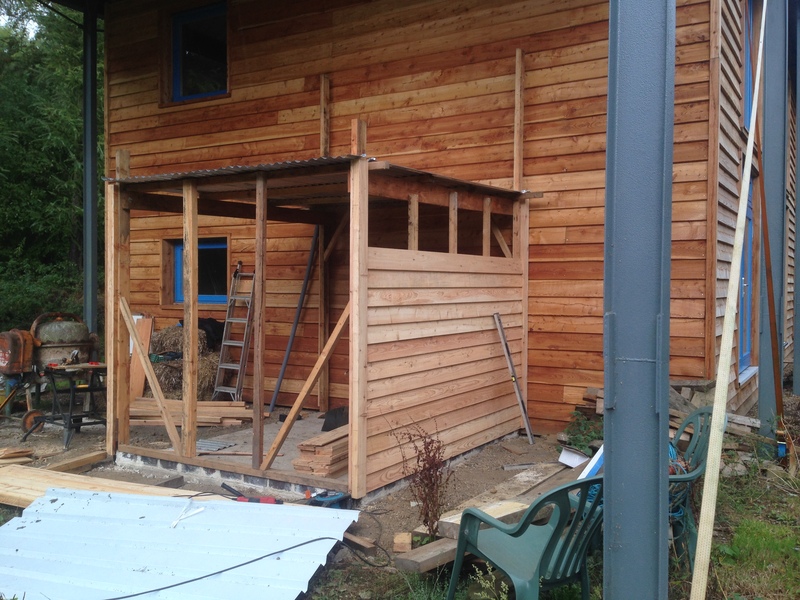 But after consideration of the amount of time and maintenance required, plus also the rather stringent atmospheric requirements for the correct setting of the mortar, we decided to clad the outside with larch. 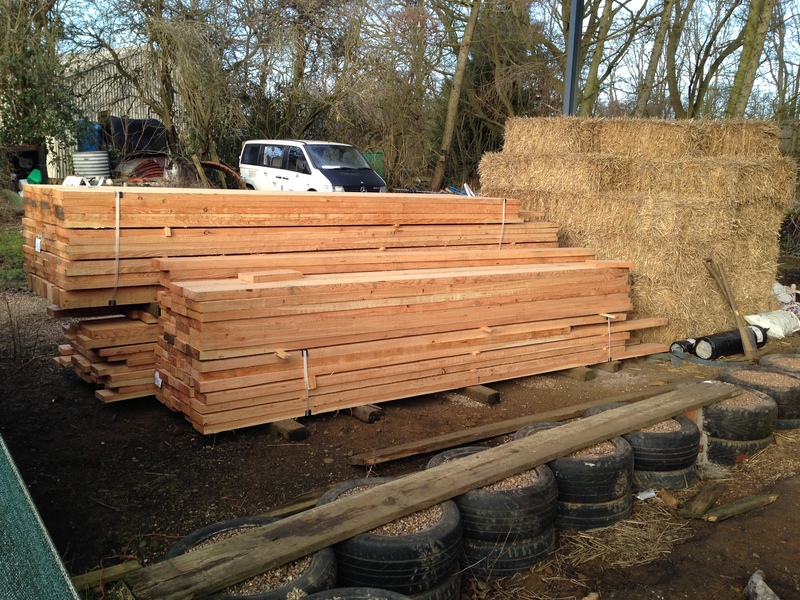 For this, we again sourced UK grown, air dried larch. 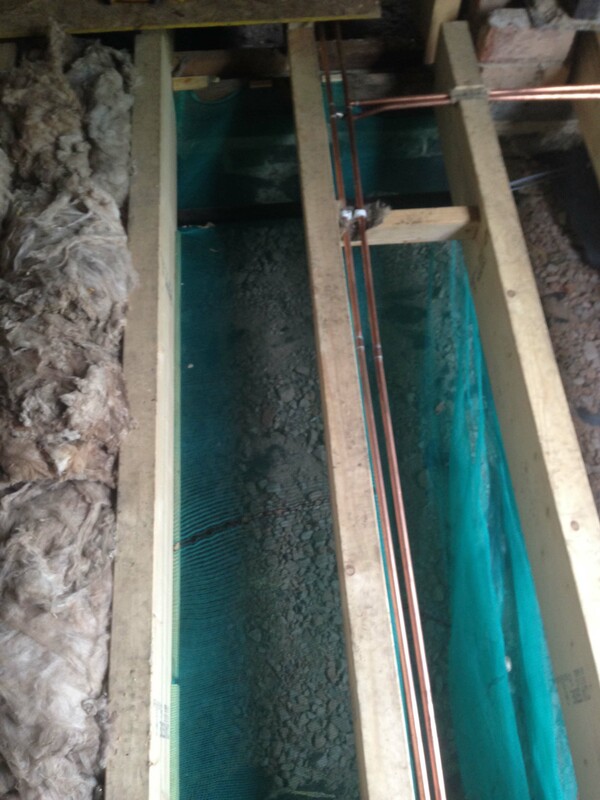 The first job was to put rodent-proof mesh between the ground floor ring beam and the ground, to stop mice getting into the spaces between the ground and the floor, and the cladding and the walls. This was nailed to the ring beam and sunk into the French drain gravel outside the tyre foundations. Once the frame was complete around the ground floor, the cladding started to go on. 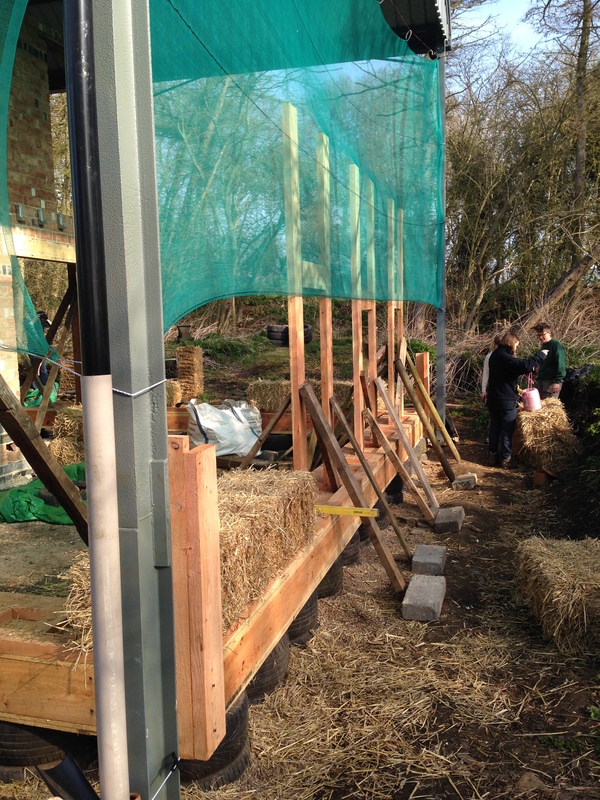 We used rough cut feather edge boards, around 200mm wide, and between 9 and 25mm thick, secured with stainless steel nails. This job was all but finished just before Christmas, and had transformed the external appearance of the house. 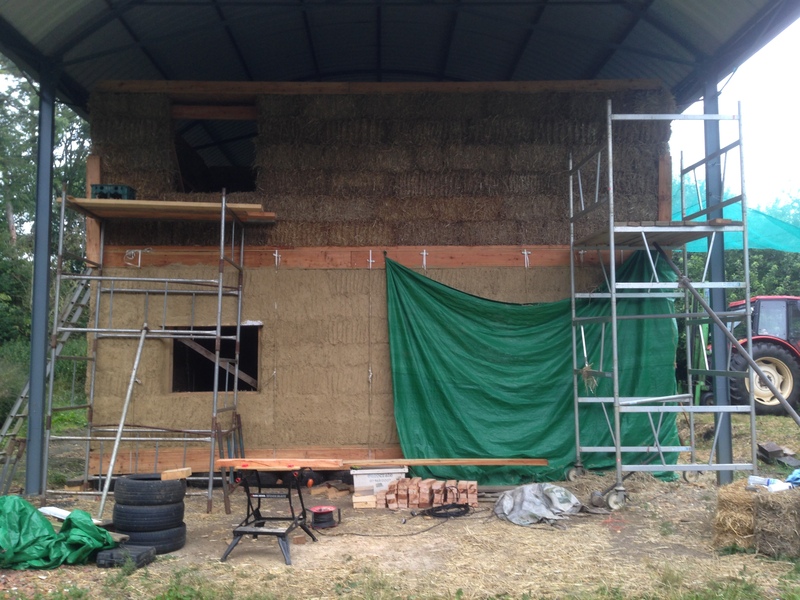 With just the last of the cladding above the top-most ringbeam to be completed, as well as the gable end under the barn roof (which required the ceiling joists to be installed to provide support), thoughts turned to getting connected to the electricity grid. 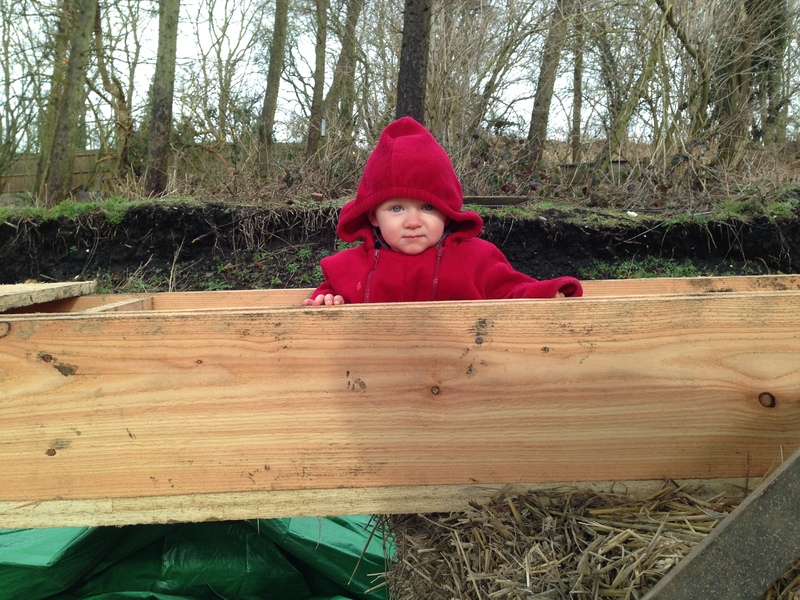 With a couple of days of in recognition of the season, the bulk of the festive period was spent with Rob, Chris and Katie digging up swathes of the yard to install the appropriate ducting to carry the mains power from the transformer feeding the farm to the new house. This necessitated digging up areas near the grain bins, which had originally been ‘made-up’ ground after the closure of the railway line in the 1970’s. This ‘made-up’ ground had been made-up with building rubble from house demolitions in the village, some of which seemed to have involved minimal demolition before being tipped into the ground! One piece of ex-concrete floor was at least four feet square and and 8 inches deep, and too heavy to lift with the digger. However, in time, we had a suitable trench, covering the 50 metres from transformer to house, and had inserted ducting and back filled. Thereafter, in an apparently uncharacteristic turn of speed, a week later, the power company had connected the cable from network to house, and the supply company had installed a meter – now just got to wire up the house! 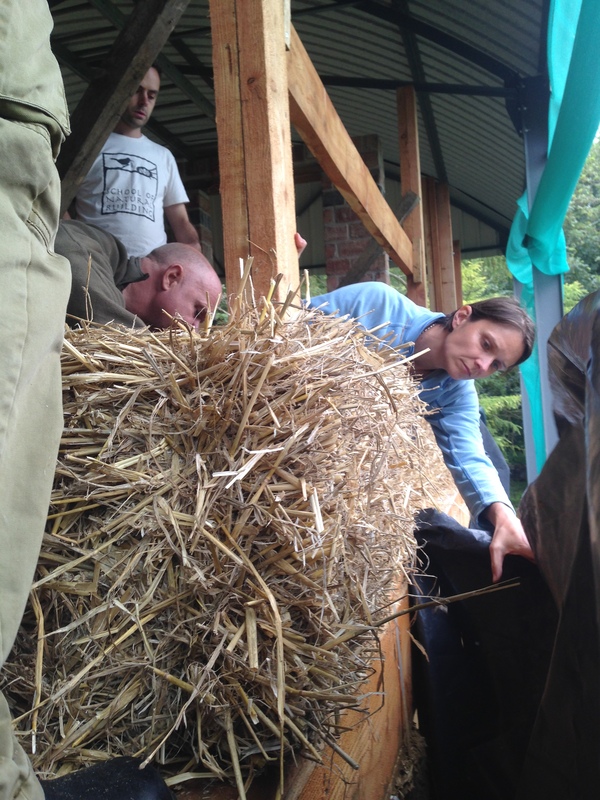 More of this later…. Back to indoors in the new year, when we made relatively short work of installing the ceiling joists across most of the house. Hot on the heels of this came the long awaited arrival of the windows. After an interminable process of backwards and forwards emails with the suppliers, getting dimensions and details correct, a lorry arrived bearing two very heavy pallets, made up of our 2 tonnes of triple glazed windows. 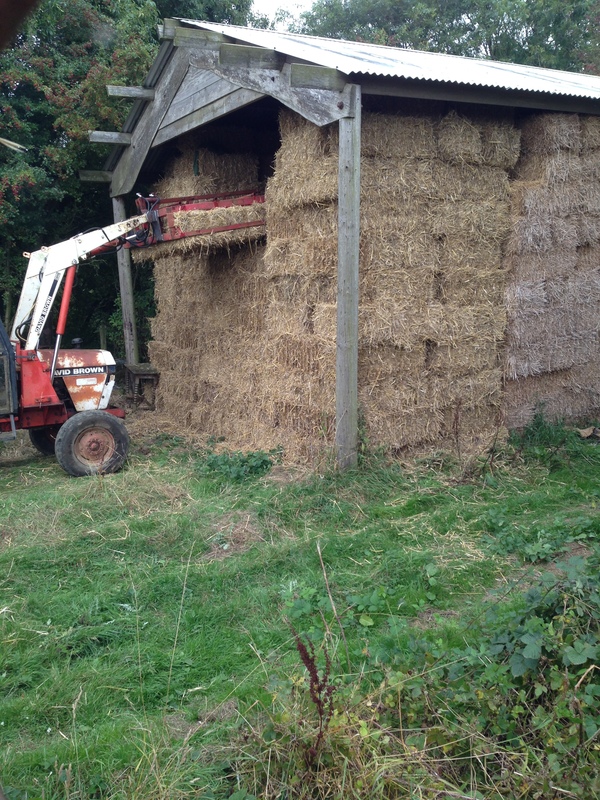 A very nervous Chris then unloaded them safely into the shed whilst equally nervous house-builders looked on! 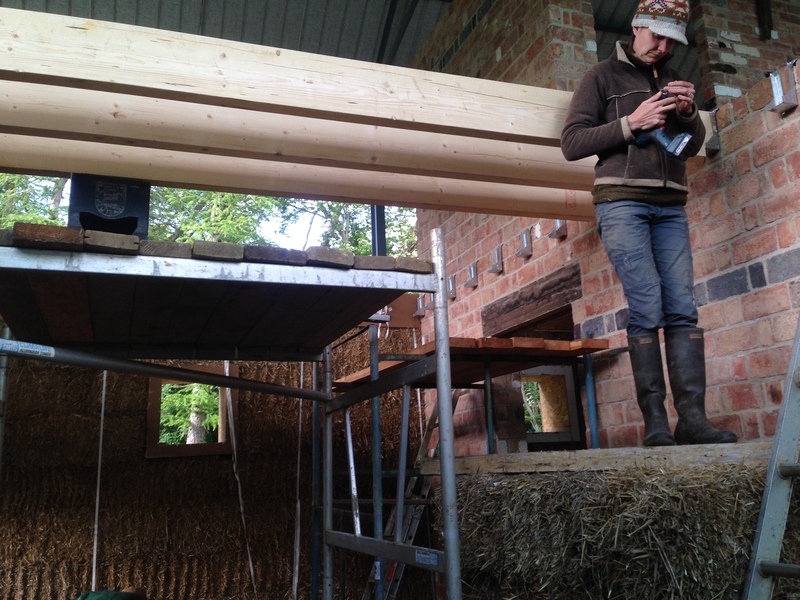 So, joists all ready and windows arrived, Jamie and the chippies came back and completed the remaining cladding and helped us install the largest of the windows on the south side, including the central sliding doors which weighed about a third of a tonne! These main windows only took a couple of days to get in place, and thereafter we were left with the task of installing the toplights above these, and the rest of the windows. Being all triple glazed, they are solid, but this makes them heavy. 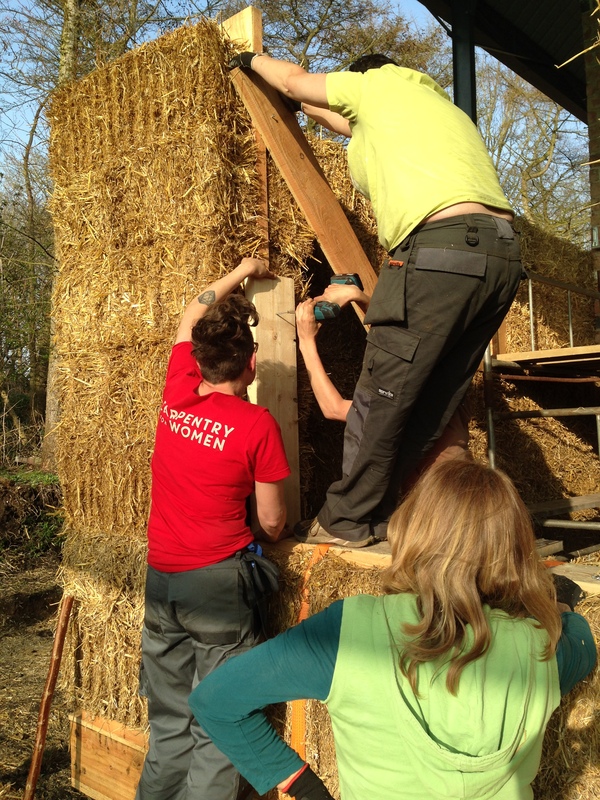 So after an Easter of illness, when we did very little work on the house, we returned ready to go with installing the rest of the widows……and in the course of lifting the first one into place, I put my back out and had to have another 2 weeks off!! Still, that all seems a while ago now, as we have just spent the last 3 weeks getting the last of the windows in, and so depriving the local wood pigeon population of a night-time roost. As well as that, we have at last installed all the ground floor joists and all the noggins and wall ties that strengthen each floor. 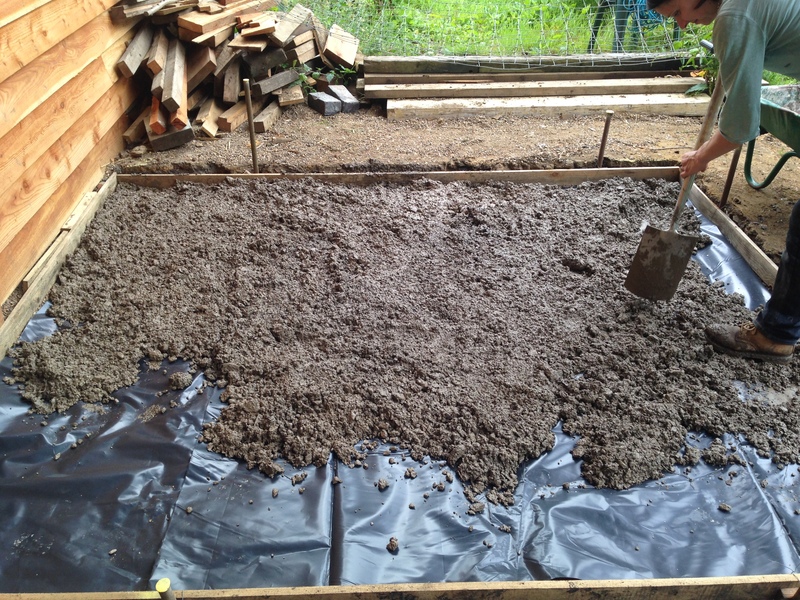 One interesting interlude to this process was the need to dig a couple of radon sumps. 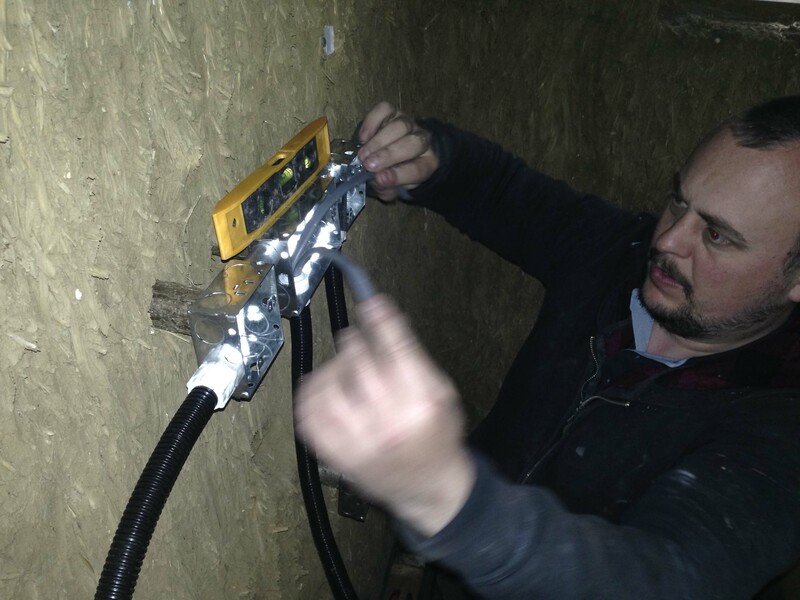 The area around our village is considered a high radon risk area, and since we have a ventilated underfloor void, we decided to install some preventative measures should they be needed once the house is complete. Radon is the heaviest element that remains a gas at normal temperature, so will usually remain in or close to the ground unless other factors come into play. One of these is that the pressure inside a building becomes negative with respect to outside through intended or unintended ventilation. If this happens, the gas will be sucked up into the house unless its path is barred (sealed membranes) or it is propelled elsewhere (vented to outside). 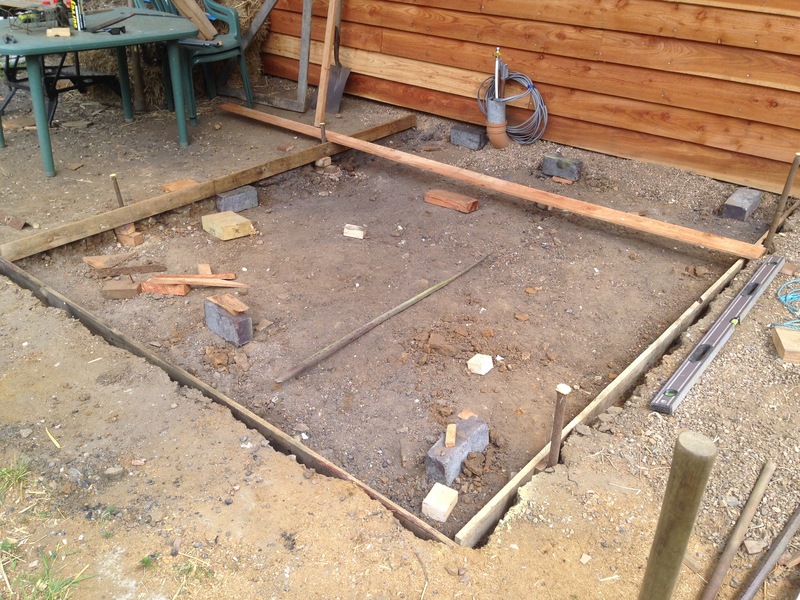 Because we could not seal the ground surface under the ground floor, due to the nature of the tyre foundations, we constructed a couple of sumps: a grand name for a hole in the ground lined with bricks. 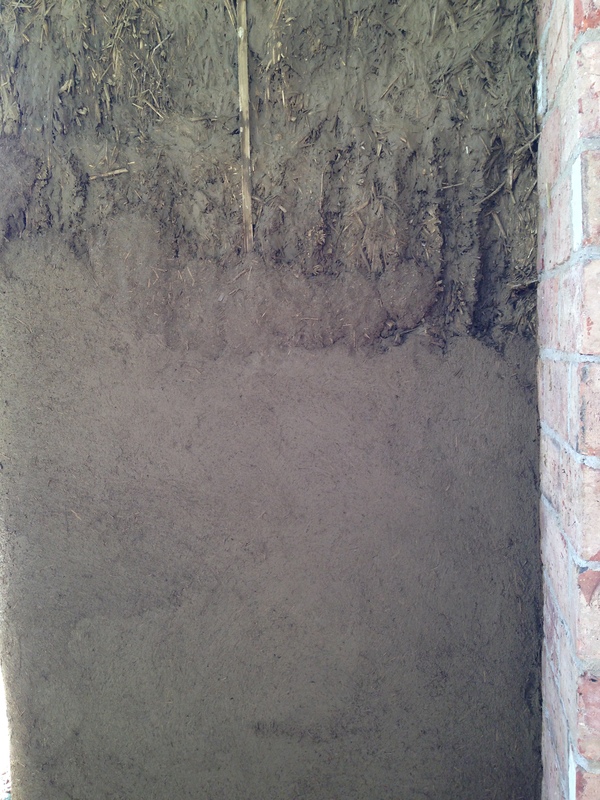 Any radon escaping the soil and underlying rock would lie in this, and if necessary in the future we could vent this to outside through a horizontal flue. Once the house is finished, we’ll test for actual radon levels and then see if venting is necessary. 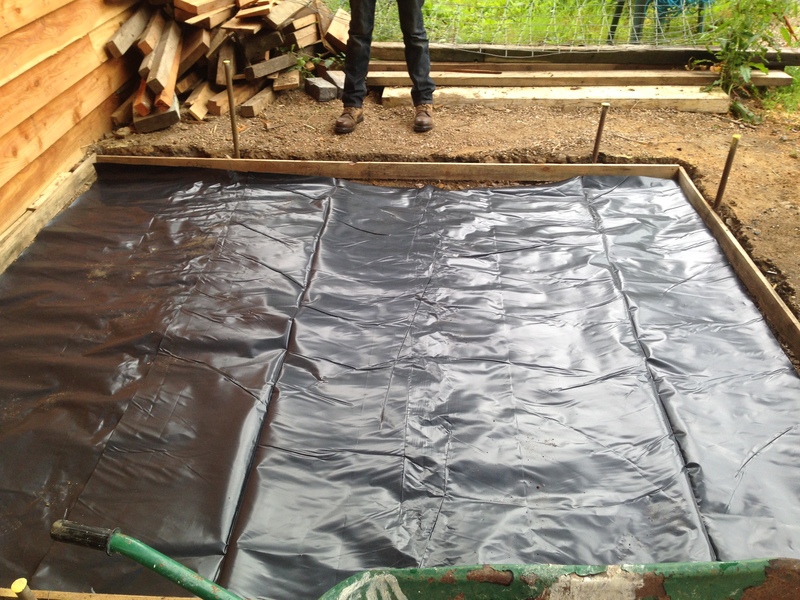 Otherwise, we’ve installed a partial seal in the form of a heavy plastic membrane lying on the ground surface below the floor joists. Oh, and we’ve had the solar panels installed…..20 panels giving a total array of about 5.8kW. And they look smart! So that’s a very brief version of about 6 months of hard work. 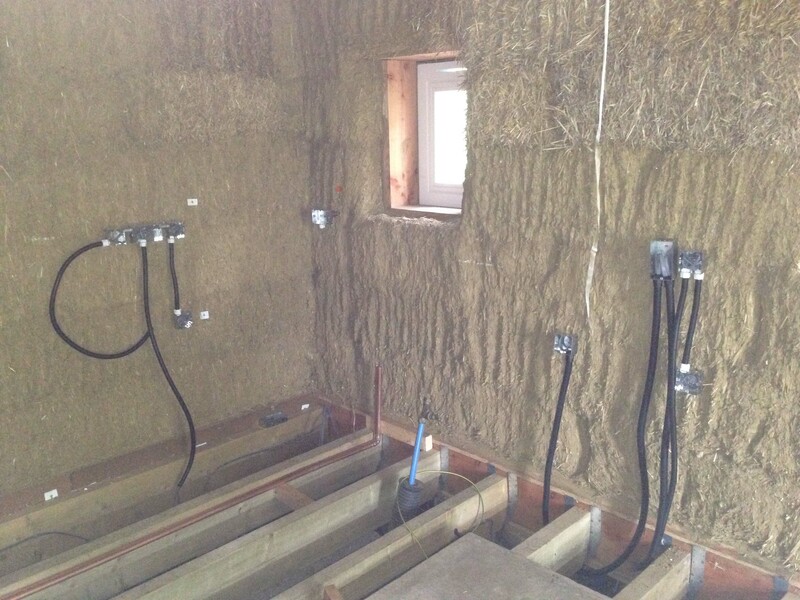 We’re now in the throes of doing the wiring and plumbing, before we can then finish the floors and ceilings with floor boards, plasterboard and insulation. More of this in due course. This entry was posted in Uncategorized on April 24, 2016 by scampifield. 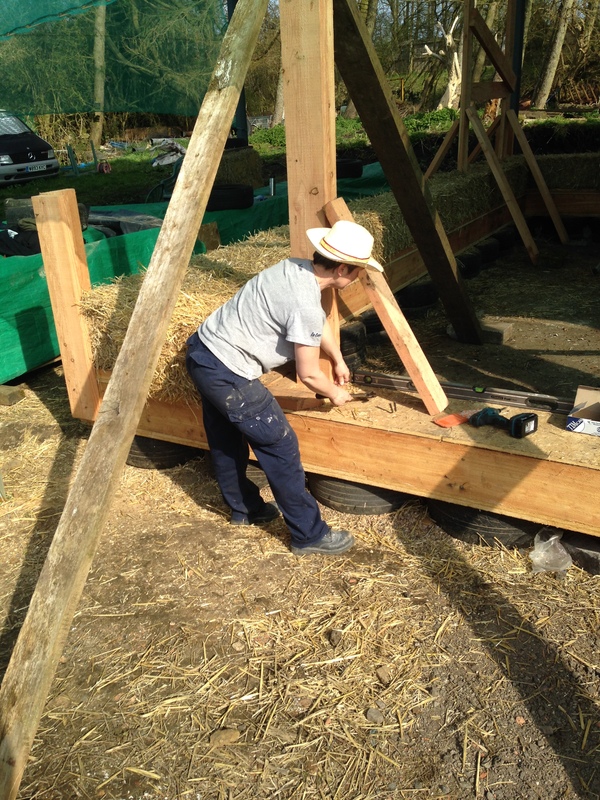 We started putting up the joists for the first floor a couple of weeks ago, to provide a platform for building the first floor walls proper. This went really well, with the lounge/study ceiling going up quickly and easily. However, when we went to start the kitchen ceiling, in the east end of the house, we found someone had beaten us to it. 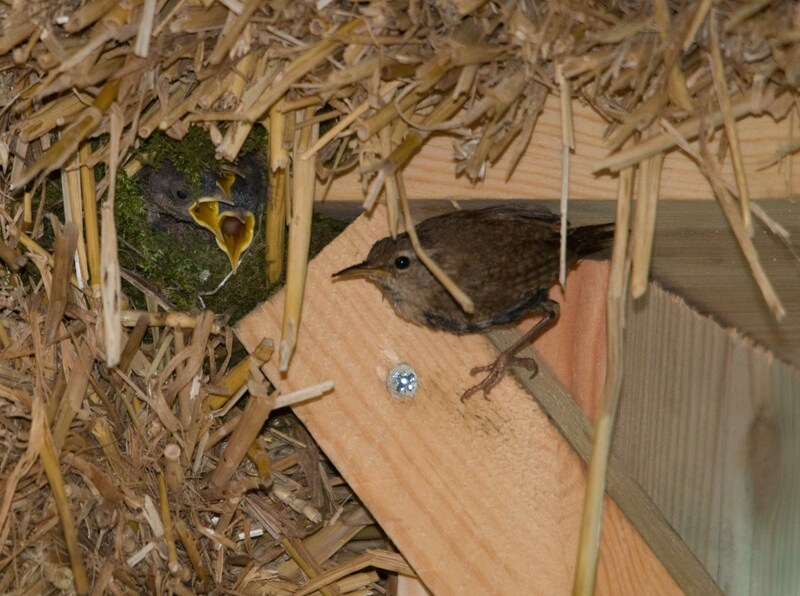 In a corner of what will be the utility window, in a gap between straw and frame, a pair of wrens had quietly built a nest whilst we were occupied at the other end of the house. We found the nest when the chicks (at least three) were about half grown, so we left them to it for a week or so, whilst they fledged and we put up the bathroom floor. I can now report that they fledged successfully around 1 week later, and have been seen fluttering around the garden in an amateurish way since! 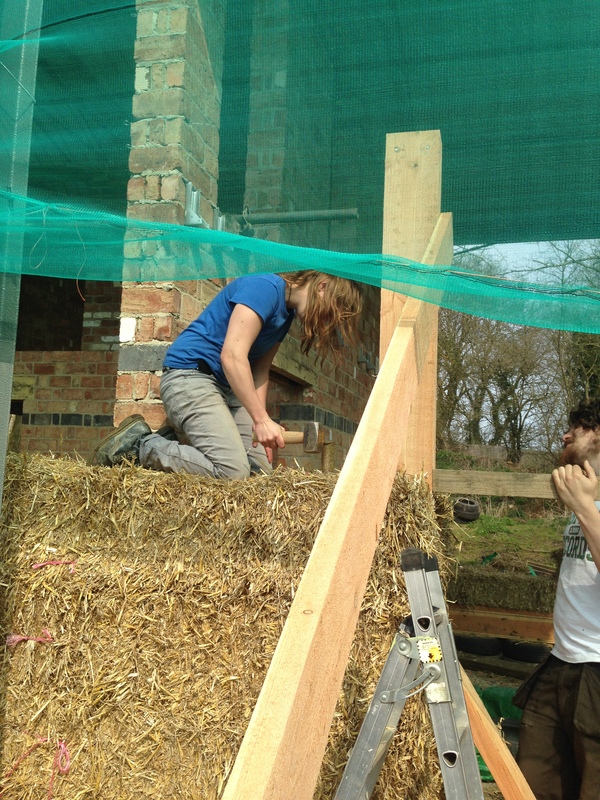 Meanwhile, we have finished the joists on the first floor, in preparation for installing the window posts for the bedroom windows, all in advance of our colleagues from StrawWorks coming at the end of July to help us put up the bedroom walls. This entry was posted in Uncategorized on June 25, 2015 by scampifield. 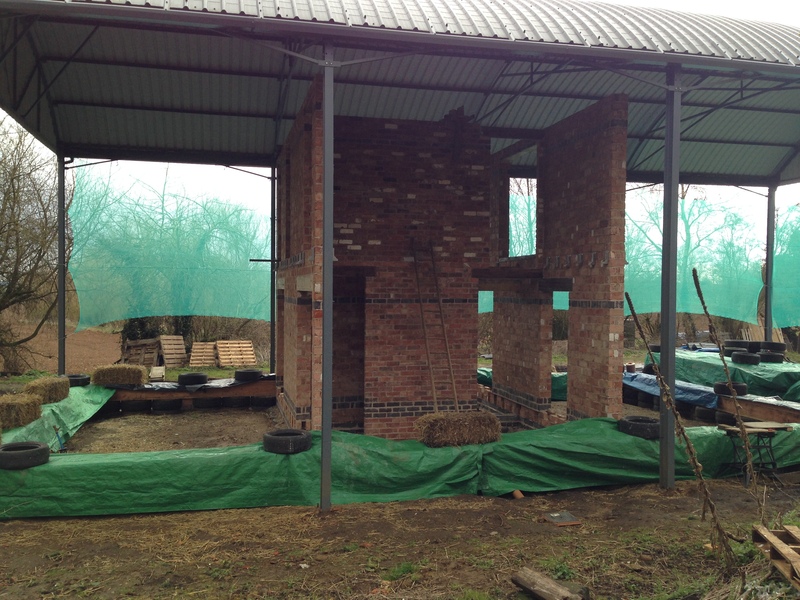 Since I last wrote, the Duffin’s boys have finished their stuff and left us with a smashing set of initially rather lonely looking brick walls, awaiting the warm embrace of straw. 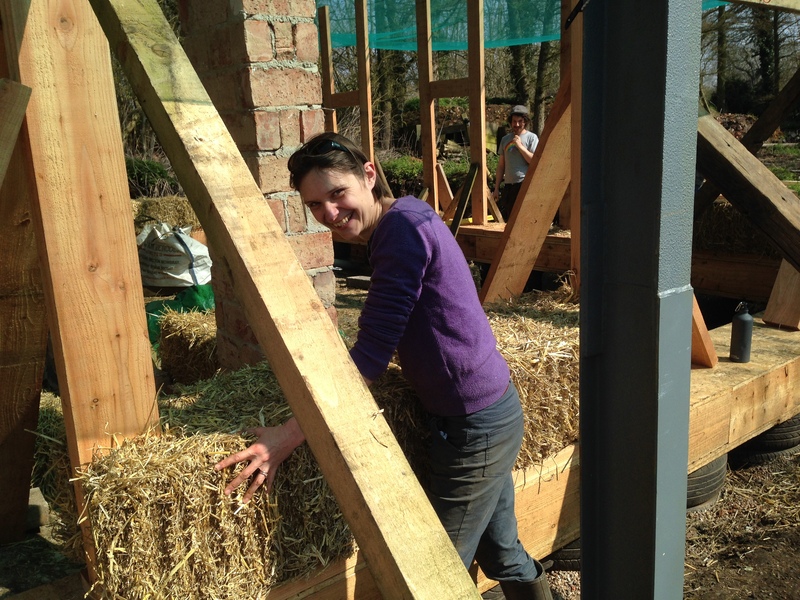 So, after a frantic Easter holiday weekend of getting ready, finishing off the woodwork for the ground floor doors and windows, we welcomed the wonderful, unflappable Emma Appleton, from Straw works to run two week-long straw-bale building courses. 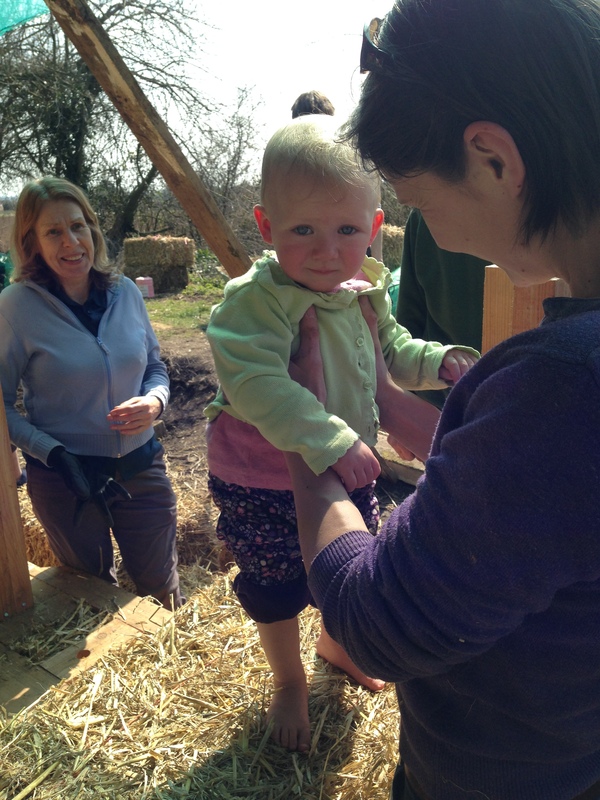 Over the ensuing two weeks, a selection of new and not so new straw-bale builders visited the farm and added their labour and enthusiasm to our house. 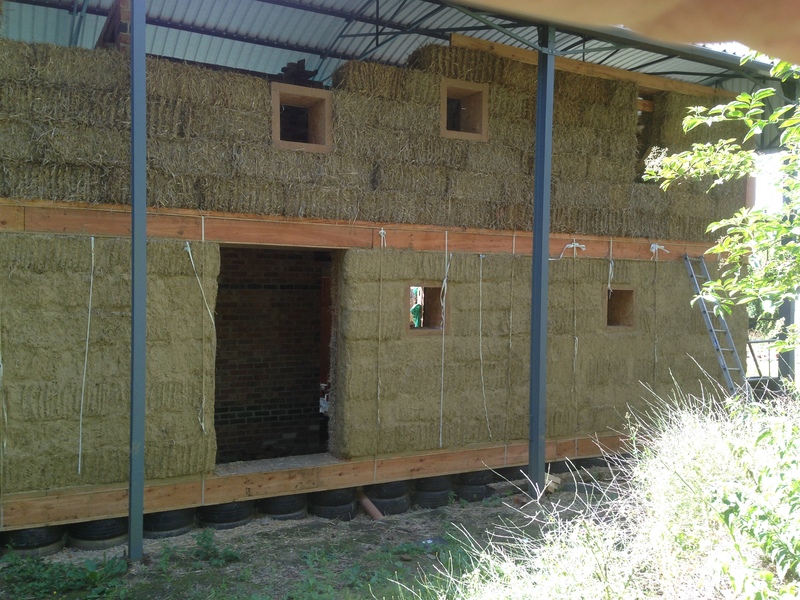 First, we installed the window posts (form the jambs once in place), and braced them so that they remained vertical and parallel until the bales and wall plates were in place. 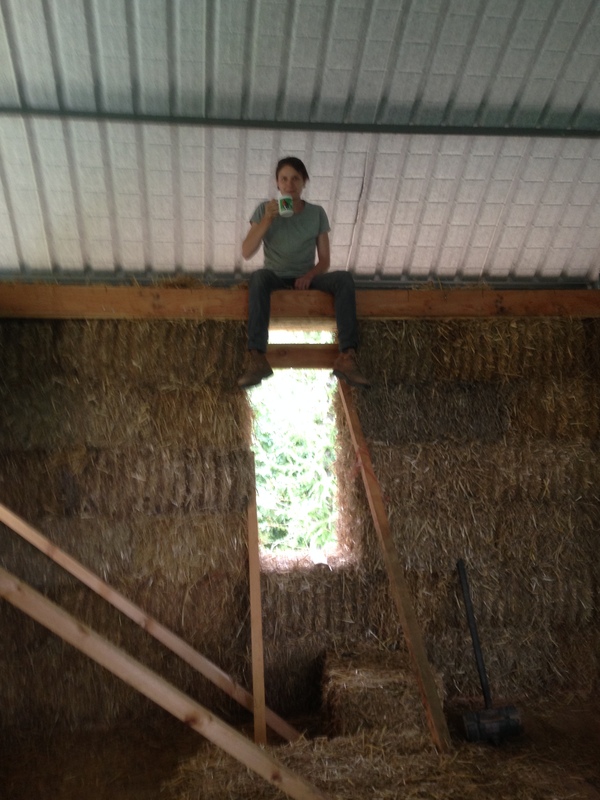 While some of us did this, others began to measure and size bales to fit along the walls, and to prepare the hazel stubs upon which they would be impaled. 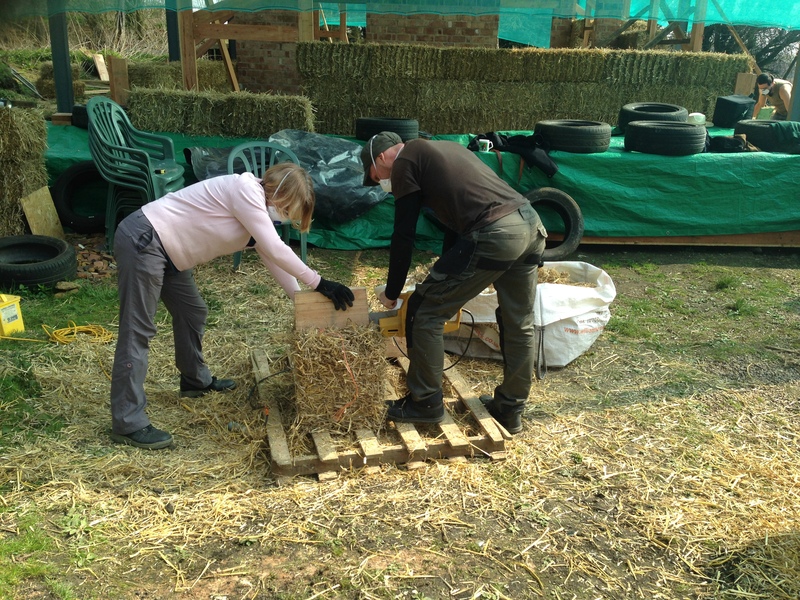 Once measured and sized all around the walls for the first course, the first bale was ceremonially laid onto the stubs, and squashed down by Rose! 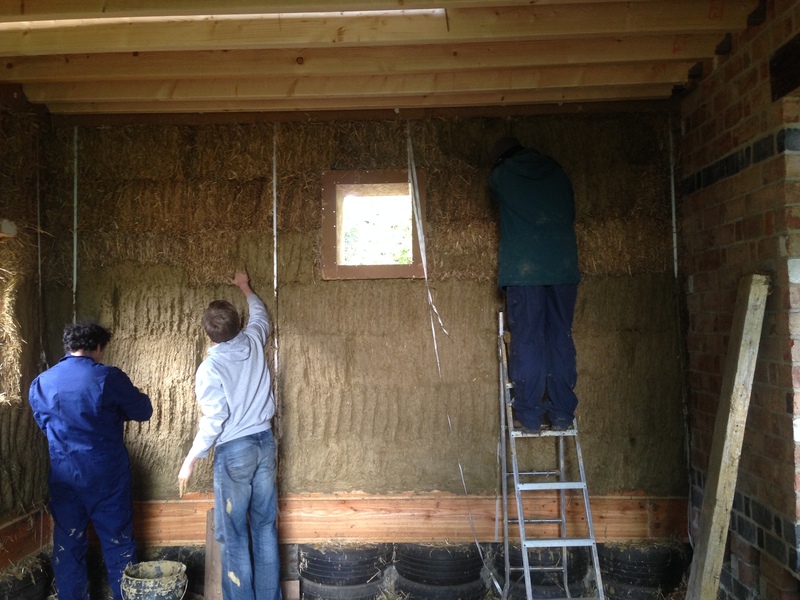 After this, the next 7 courses of bales were cut, sized, staked and laid in preparation for the placing of the wall plate sections. 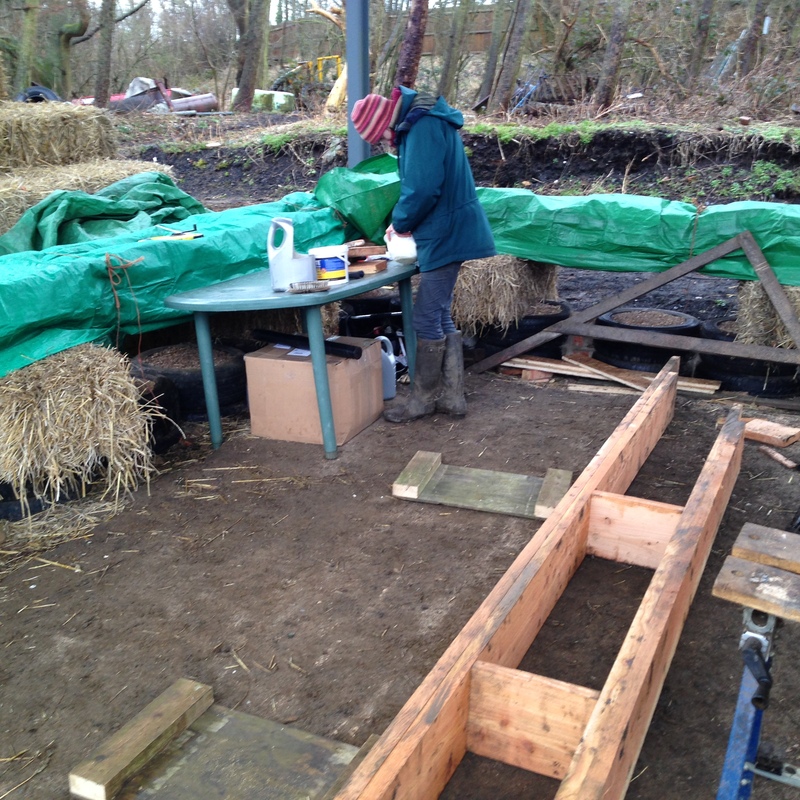 We had built these earlier, in sections, using the base-plate as a bench and template. 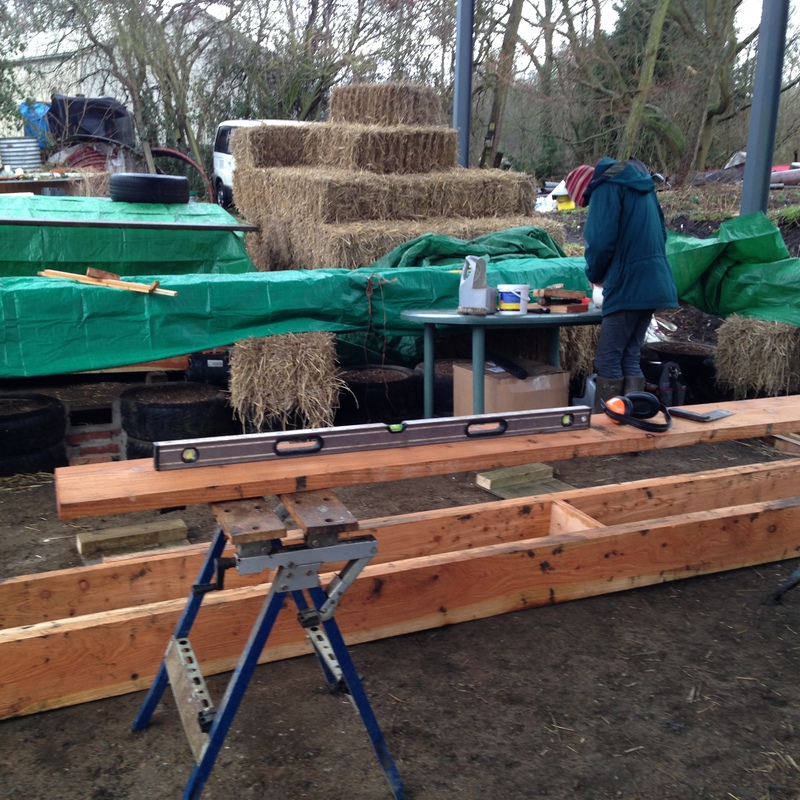 These were lifted into place by Chris’s simple but effective conversion of the fork-lift on the tractor. 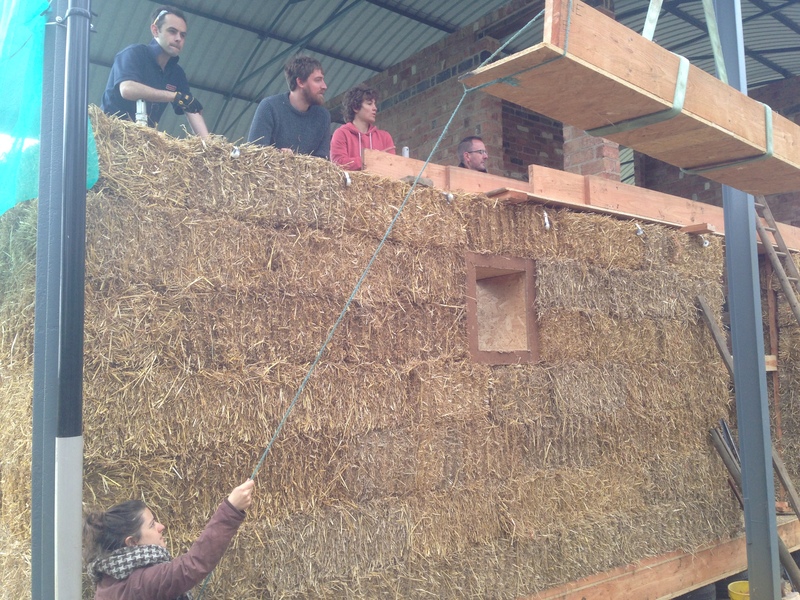 The wall-plate sections were then raised sequentially, and manoeuvred by hand into place on the top of the bales, so that they fitted over the window posts. Once the wall plate sections were jiggled into place, and joined together, we then prepared to compress the wall to give it its final strength. We place haulier’s ratchet straps at intervals along a section of wall, passing under the base plate and over the wall plate. These were gradually and sequentially tightened to apply an even force down through the wall. Once we couldn’t apply any more force, we checked the levels, then put in polythene packing straps alongside the ratchet straps. These were tightened to keep the compression when the ratchet straps were released and transferred to another section of wall. In this way we compressed all the walls. 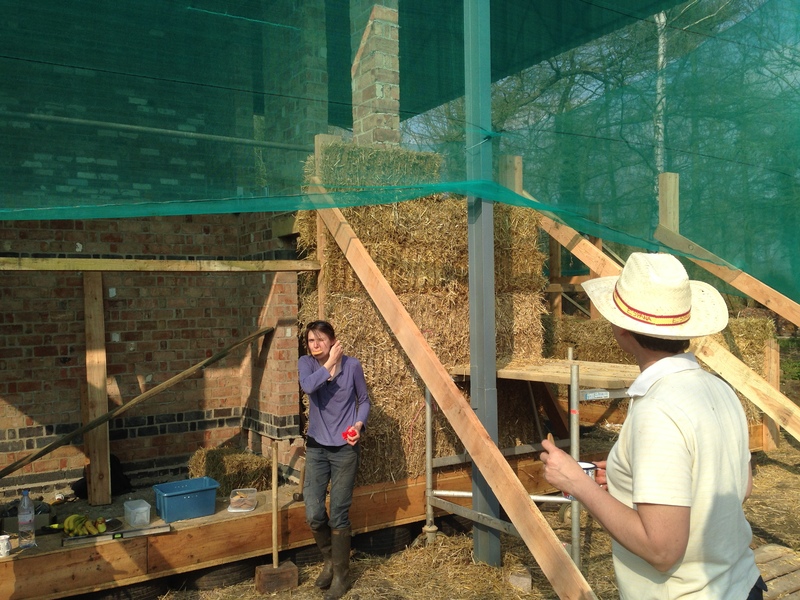 So, after two weeks hard work, we had what looked like a smart straw bunker under a shed – the ground floor walls. 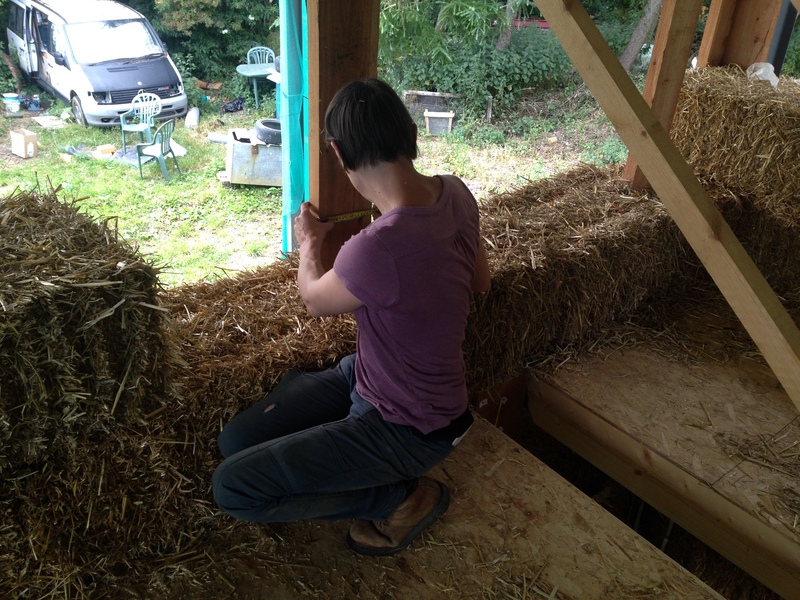 We said goodbye to Emma, and spent the weekend before the next course shaving the walls with hedge trimmers, and stuffing as many of the obvious gaps with more straw. 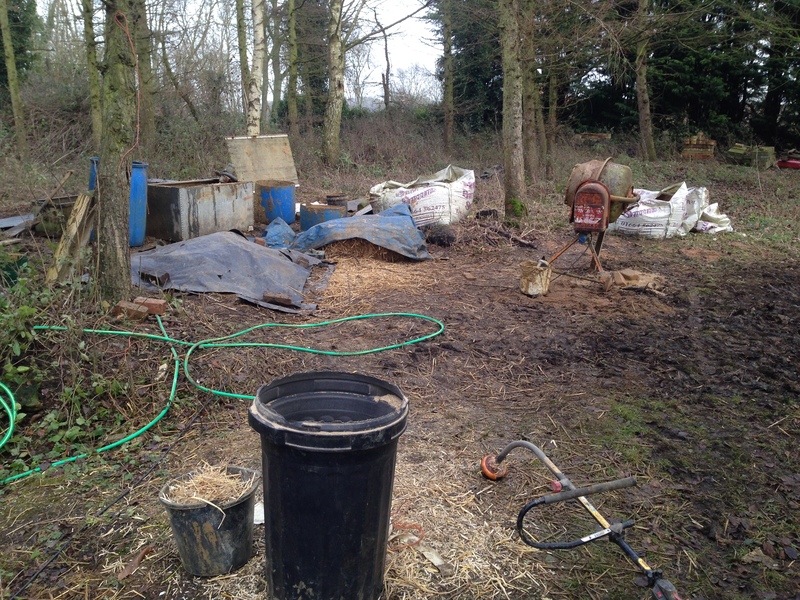 Alongside this, we scoured the farm for suitable containers, and shovelled quite a lot of clay. 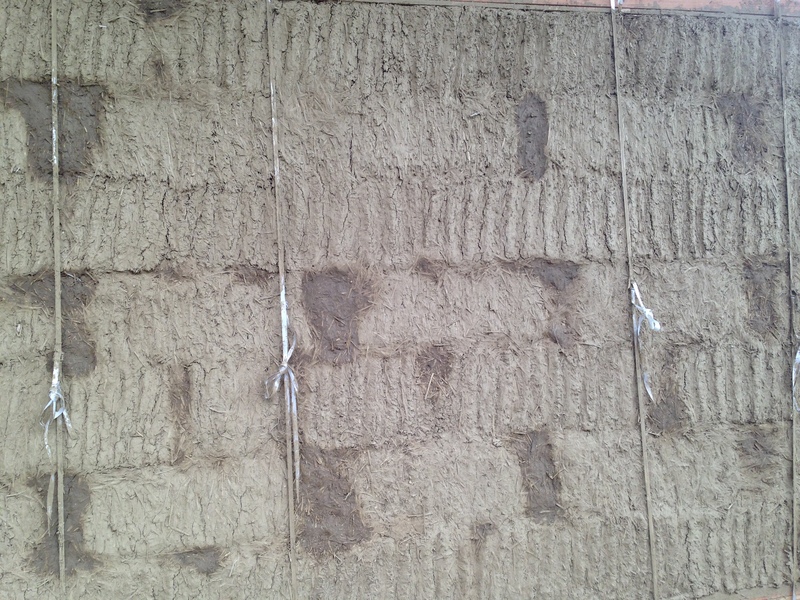 The walls are to be coated with clay plaster, which we tested for constituents and properties earlier. We collected around 1/2 a tonne of clay sub-soil that had been removed during pond construction elsewhere on the farm a few years ago, and started to soak it. 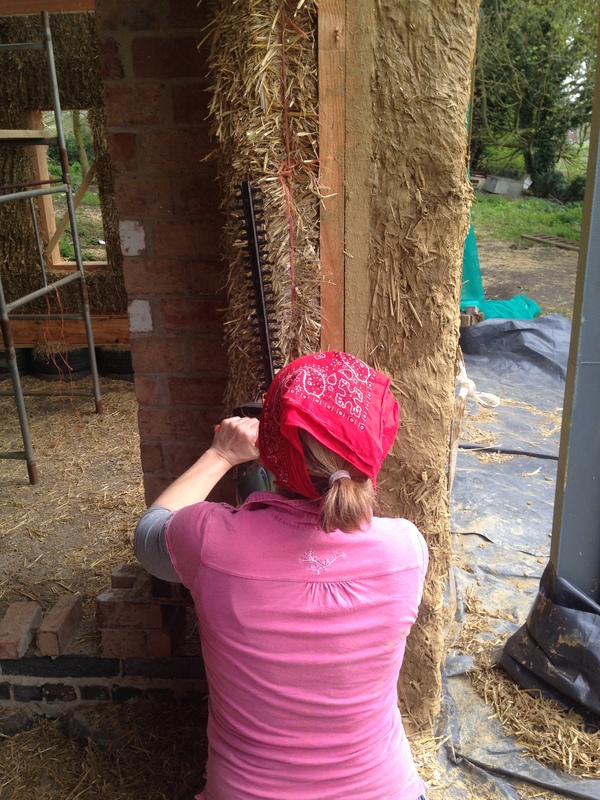 So dawned the third course – clay plastering, and we welcomed Barbara Jones of straw works to teach us how to turn a heap of clay into acceptable plaster. 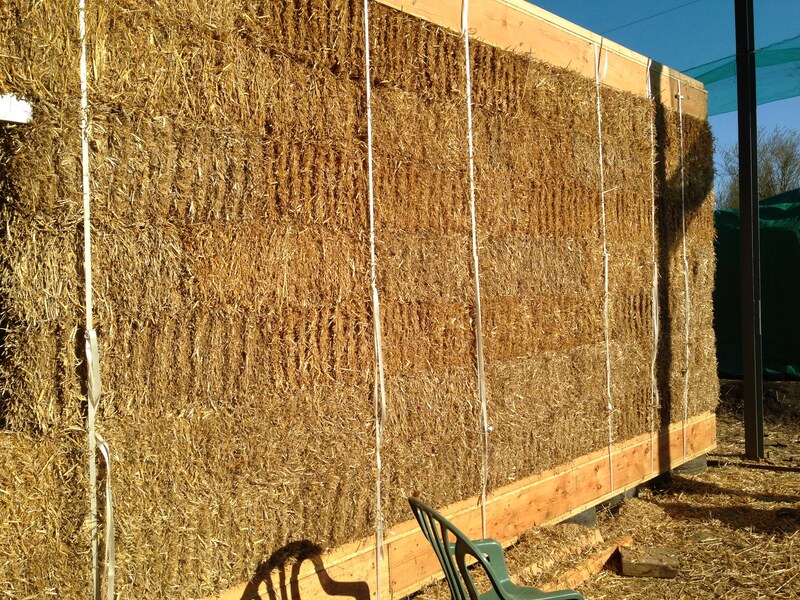 The first part of this was relatively easy, mix it with water and rub it into the freshly trimmed straw walls. 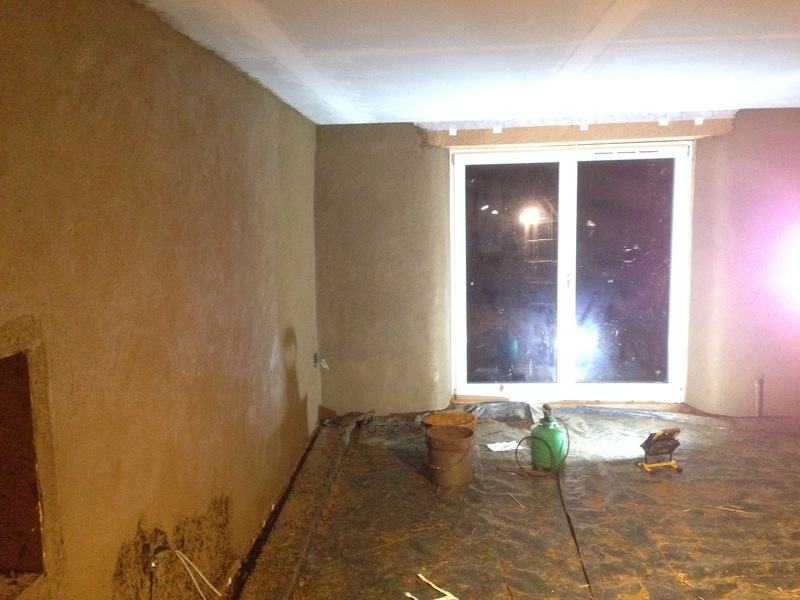 This simple coating dries to form a thin protective coat on the walls, and a base for further smoother plaster. 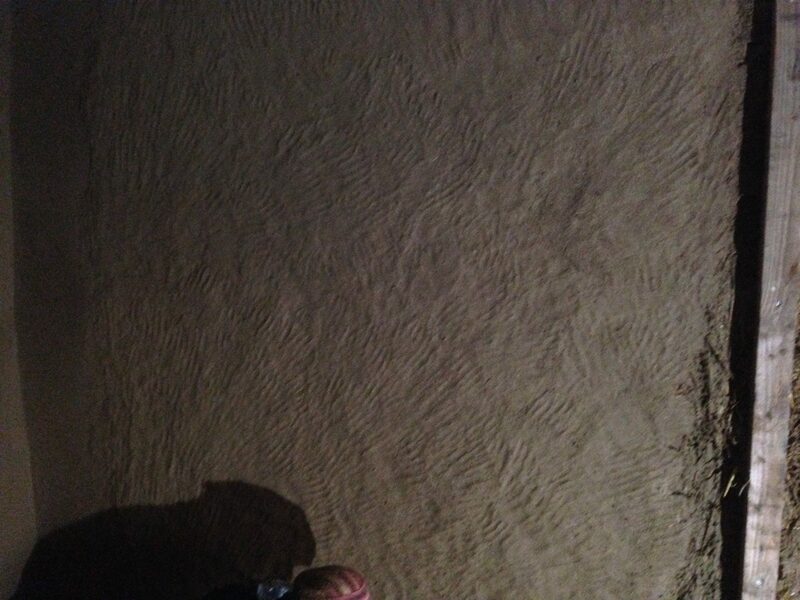 It also shows up all the holes and gaps in the walls. 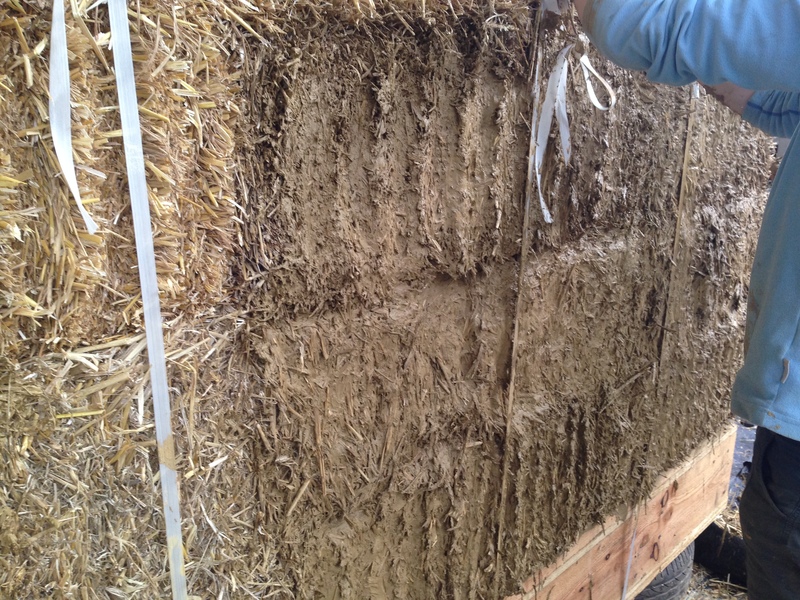 We then filled these with a mix of dry straw and then straw and clay mixed, to ensure good insulation. 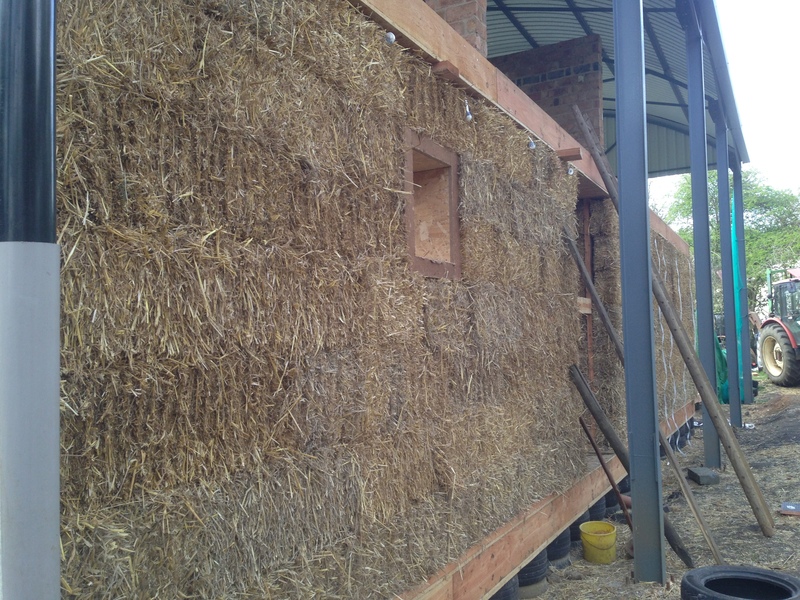 For the outside of the walls this was it, as they’ll be covered with larch cladding to give weather protection. 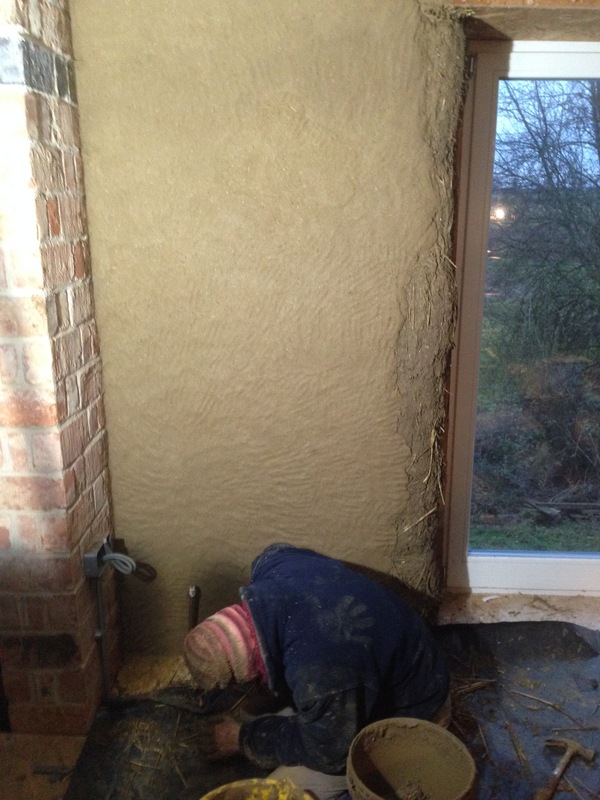 Inside, this clay ‘slip’ coat is then covered with at least one coat of a more complex clay based plaster. 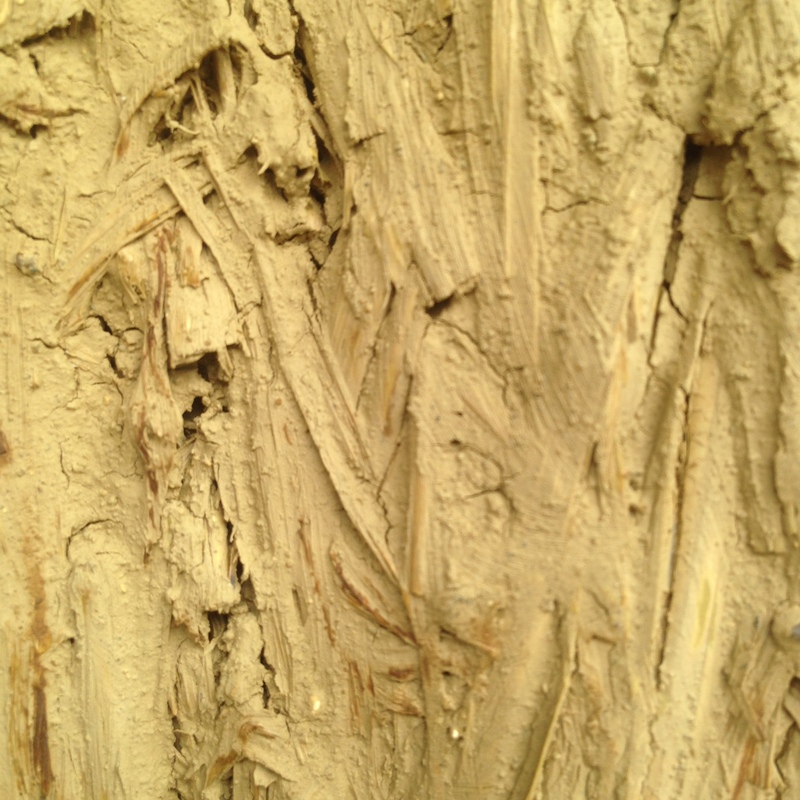 Mixed with sand and finely chopped straw, this plaster allowed us to achieve an impressive flat coat of natural plaster. 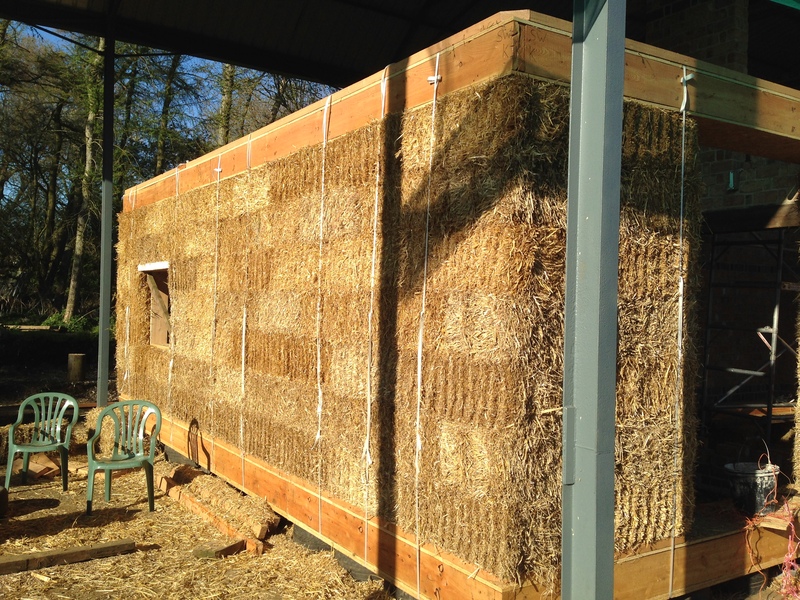 With the help of Rae Parkinson, we experimented with various mixes of clay sand and straw, and learned how to achieve a quality inside finish. 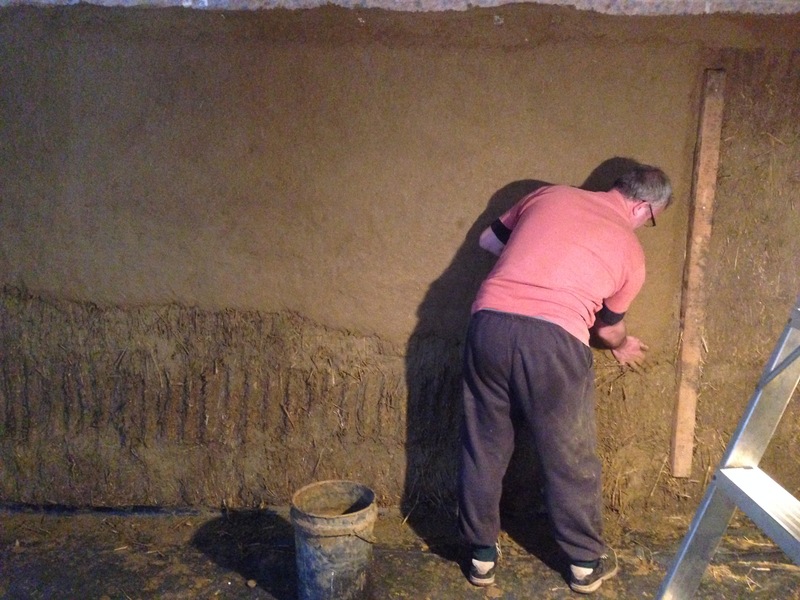 By the time all left, tired and muddy on Sunday evening, all of the outside walls were coated in a fine coat of clay’slip’ and we had done slip and intermediate plaster layers on the inside of the south facing wall. 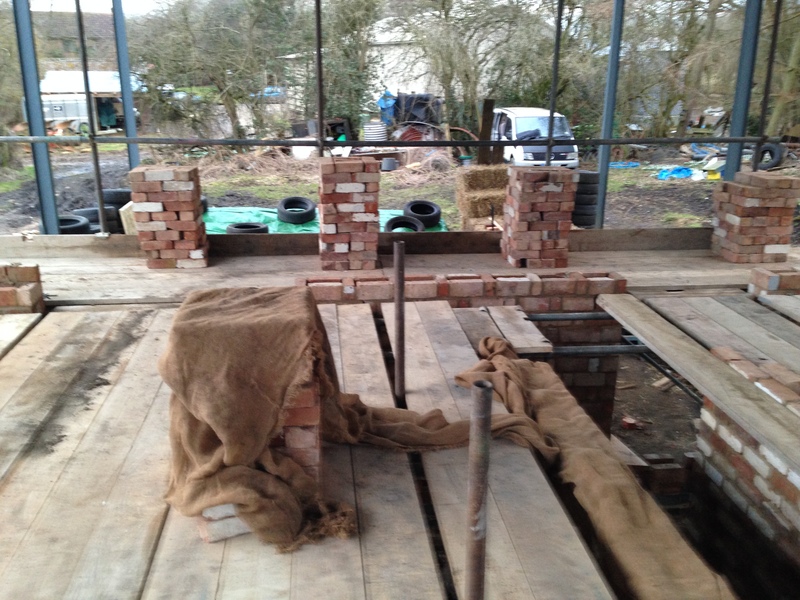 So now we have an indeterminate gap, to prepare for putting up the first floor walls. In the meantime, thank you to Emma, Barbara and Rae for their hard work and endless advice. 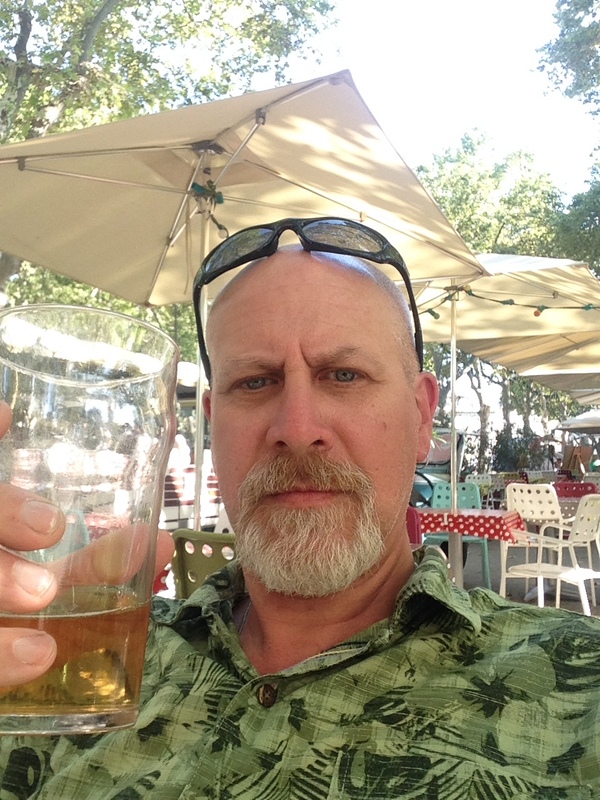 Also, thanks to Sylvan, Kate, Salli, Julianne, Sue, Pete, Guy, Jan, Alice, Jude, Matt, Jeffry, Harvey, Rueben, Wendy, Rachel, Sara, Syb, James, Alex, Verena, Enda, Lillian for all you hard work and fun. Special thanks must also go to my parents, Tony & Pam for the food (especially the cheese!) 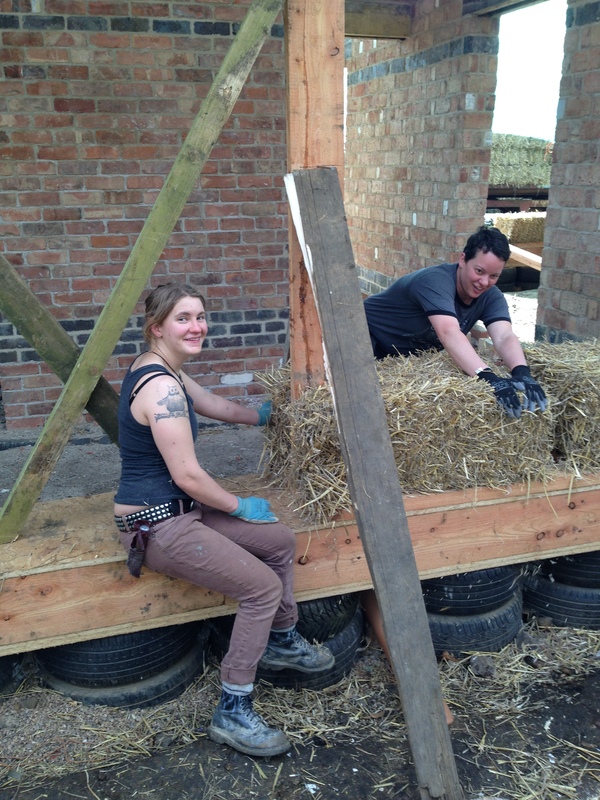 and to Chris and Ann for feeding us, heavy construction and giving Rose a wonderful three weeks while we ran around frantically and kept east Leicestershire builder’s merchants in business! This entry was posted in Uncategorized on May 3, 2015 by scampifield. Well, mud and weeds anyway, the lunacy is general and not directly a result of the house. Since completion of the sewerage system, things have been moving behind the scenes (not in a sewerage sense), with sorting the various technical drawings and plans for the capping of the foundations ready for the wall raising. Part of this involved a late, but successful harvest, with the wheat only coming in in September. 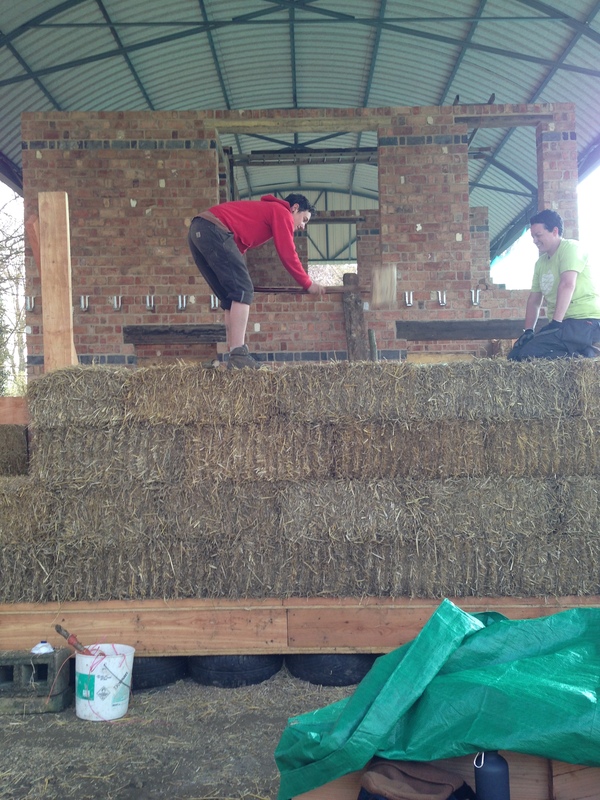 However, this has replenished our stock of straw bales, in readiness for walls. Combining happened exclusively at night, so evenings shovelling grain stopped me and Chris and Thom from getting bored after work! 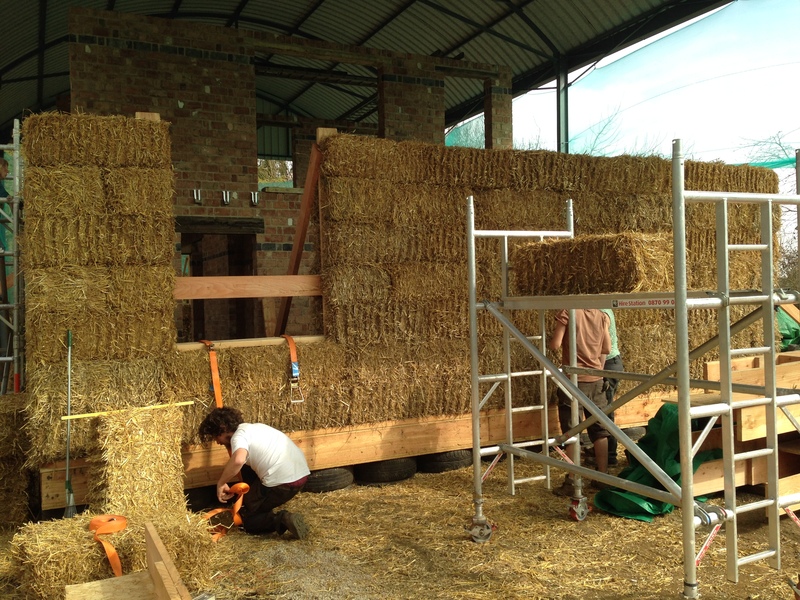 After this, and in consultation with Barbara from Straw works, we started making plans for putting up the walls. 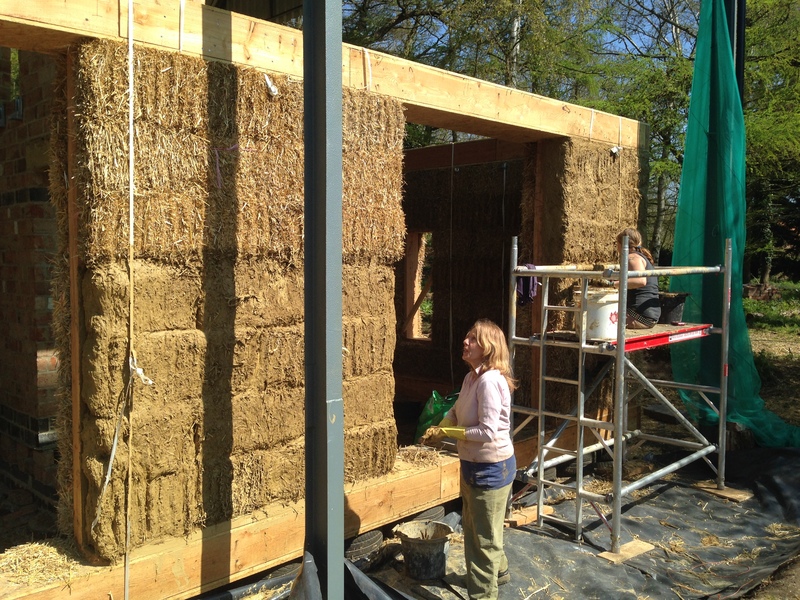 We have now decided not to use lime to render the outside of the bales, but to use a clay plaster instead. As we now know from lots of soggy digging over last winter, the soil on the farm is very heavy clay, especially the subsoil. 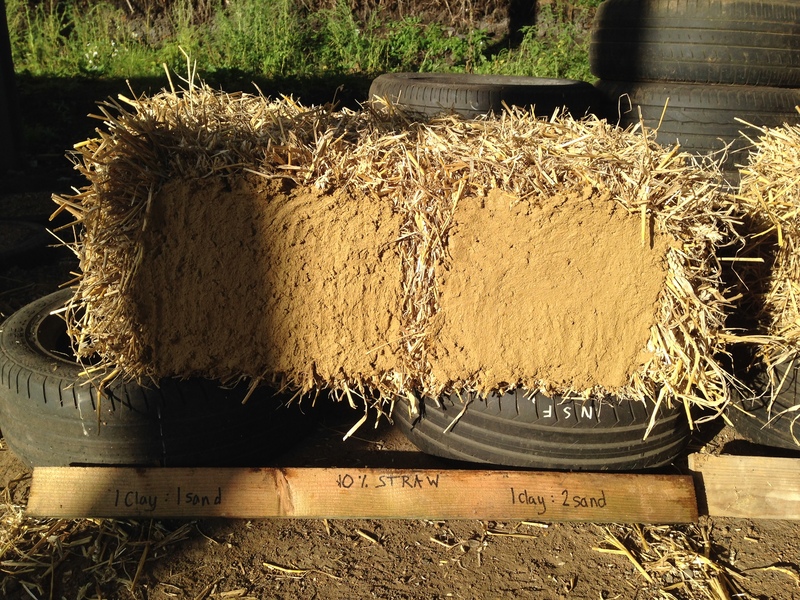 Luckily this turns out to be just what we need for the clay plaster, so with a few experiments involving various ratios of clay to sand and chopped straw, we’ve come up with a really good mix for coating and sealing the bales inside and out. 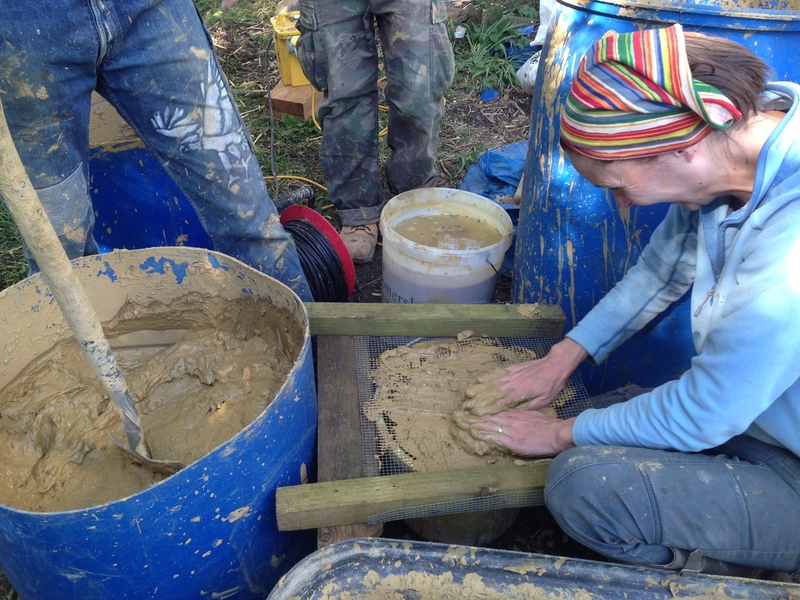 Clay settlement test – the heaviest particles settle out first, creating bands of different particle sizes – sand first, then silt then clay. 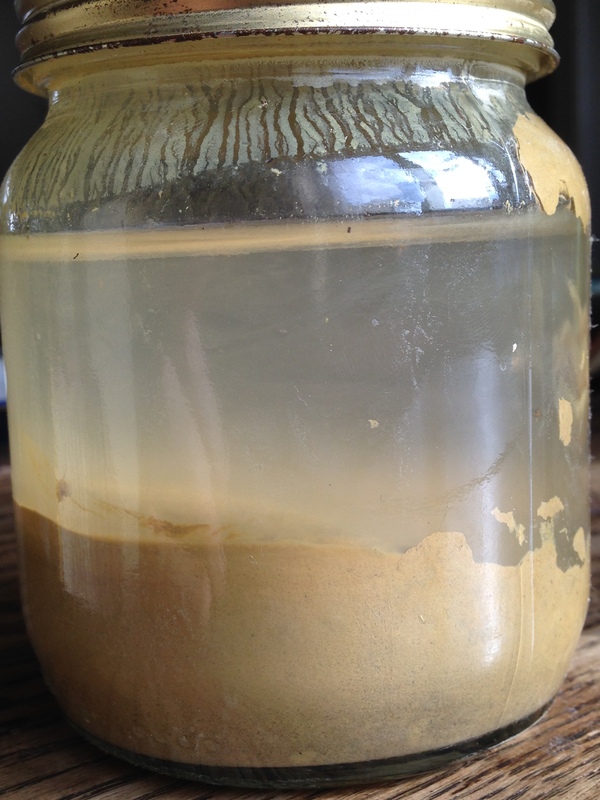 So, clay then…. 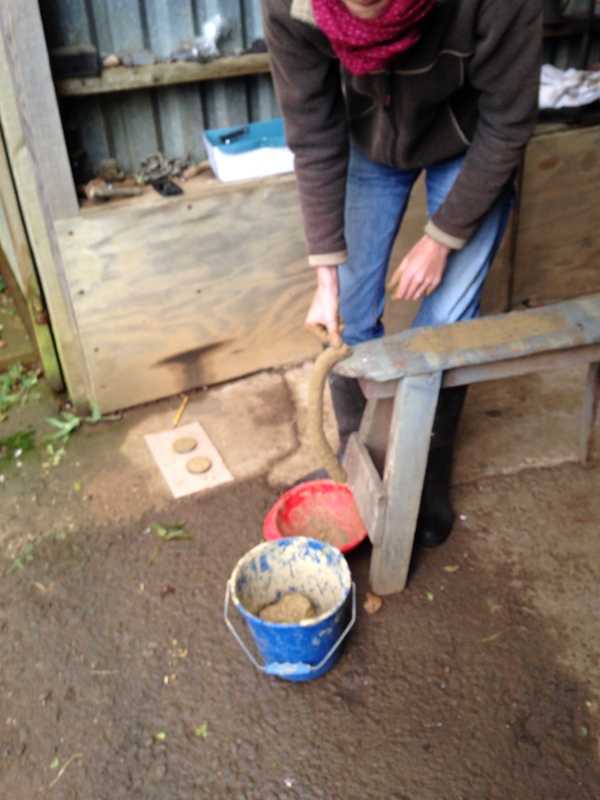 Confirmation of this – the sausage breaks sooner the more sand in the mix – anything below 20cm is mostly clay. Katie’s sausage is over 40cm!! Render mix tests. 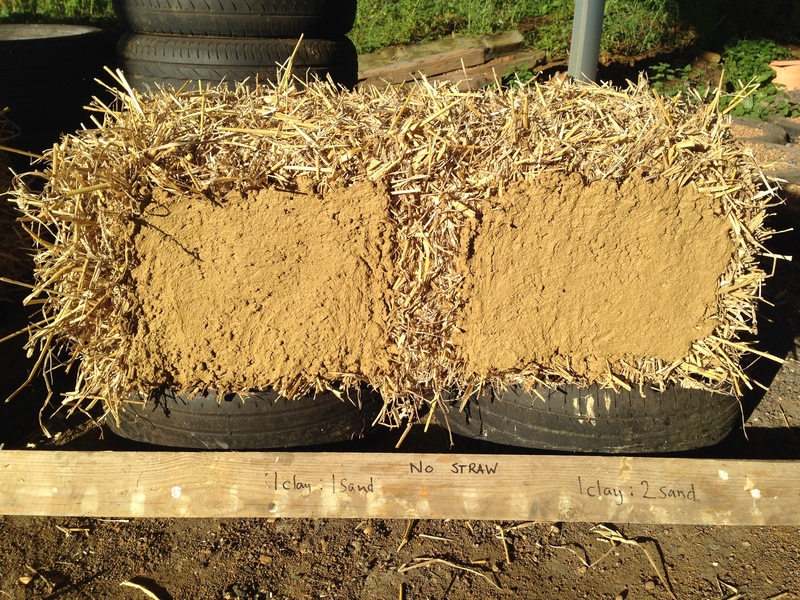 various combinations of clay, sand and chopped straw. 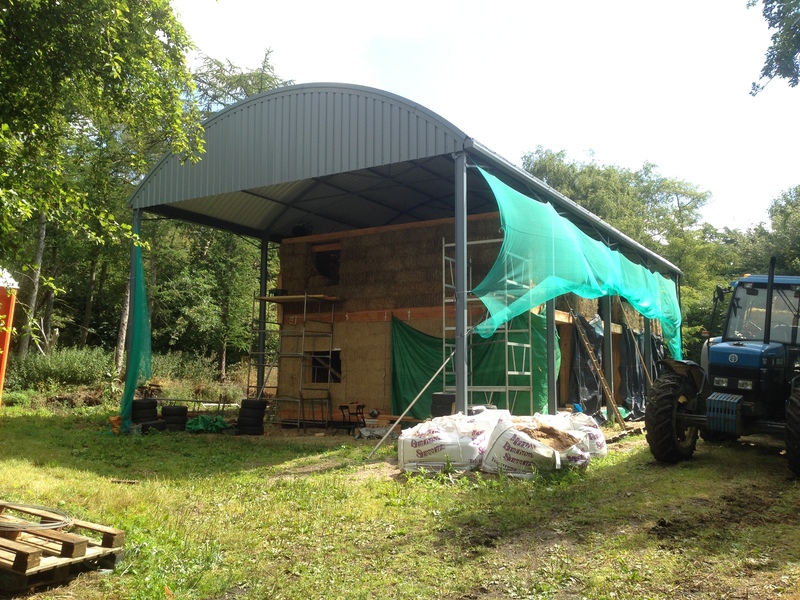 This will mean that we have to clad the outside of the building with wooden cladding, which we wouldn’t have had to have done with lime, but it’ll still work out cheaper and easier (I hope). 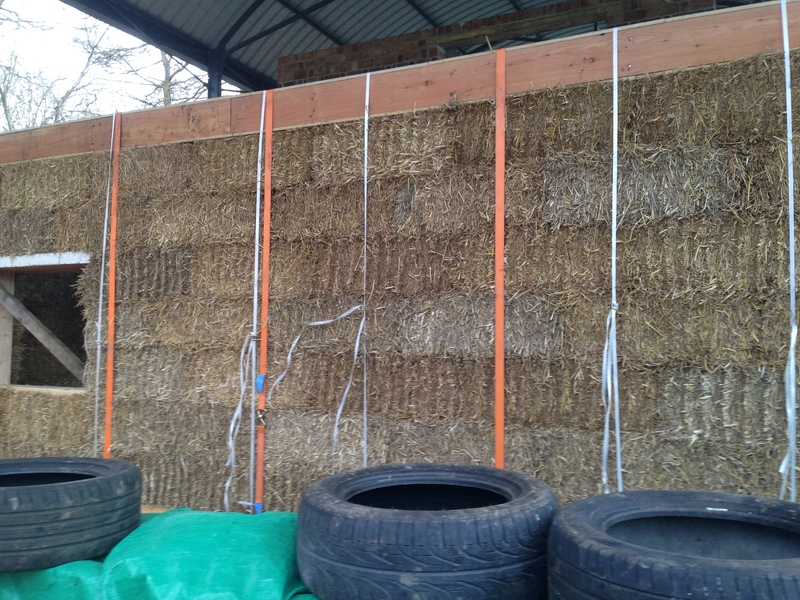 We also tested the bales for compression, so we know what height each wall section will be once compressed, so we can plan window heights etc. 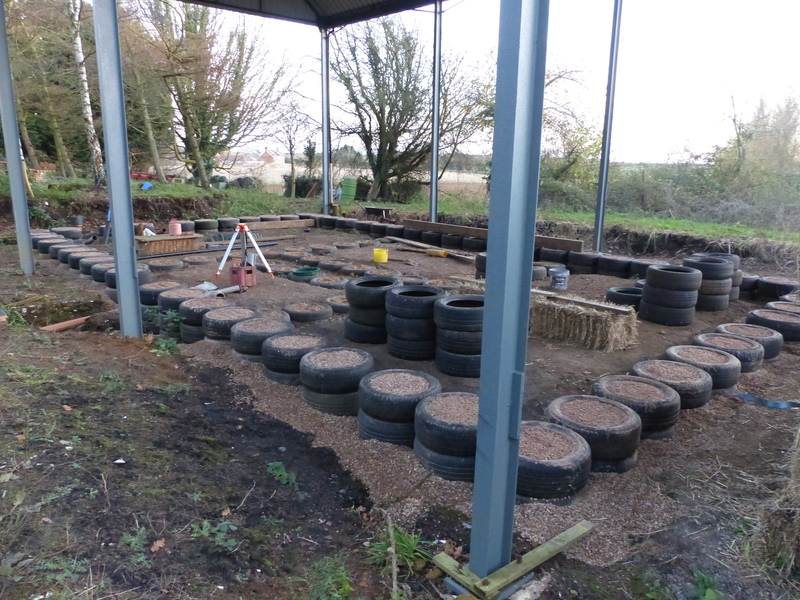 We have just finished the last, surprisingly level, run of tyres to the outer wall foundations which means we are finally building above ground! 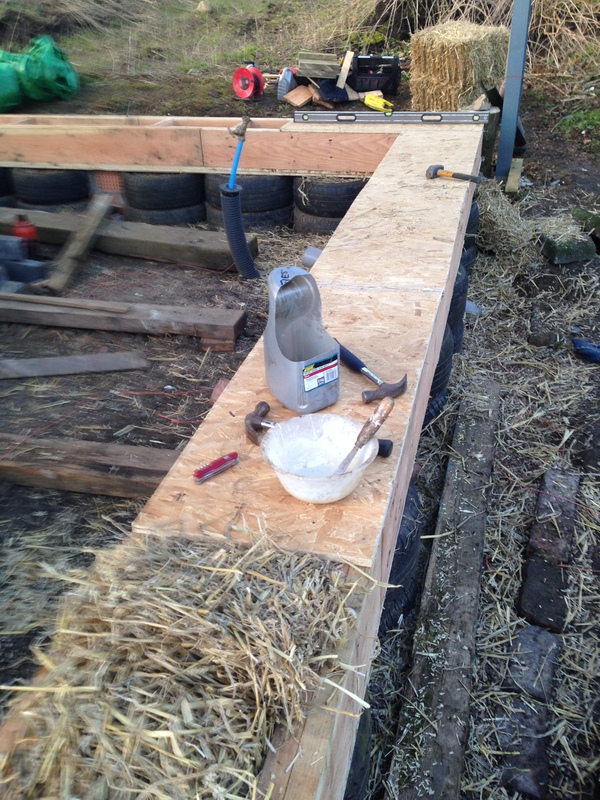 This forms the base for the wooden ring-beam that will anchor and compress the bales of the ground floor walls, so it needs to be level. 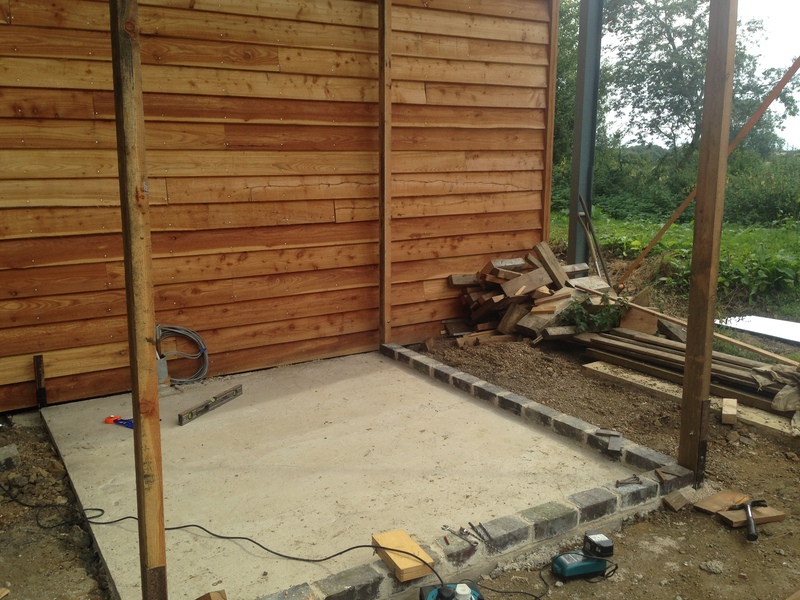 We have also completed the ‘french drain’ around the outer edge of the foundations – the shallow trench filled with gravel that keeps the foundations and lower walls free of standing water and splash back. 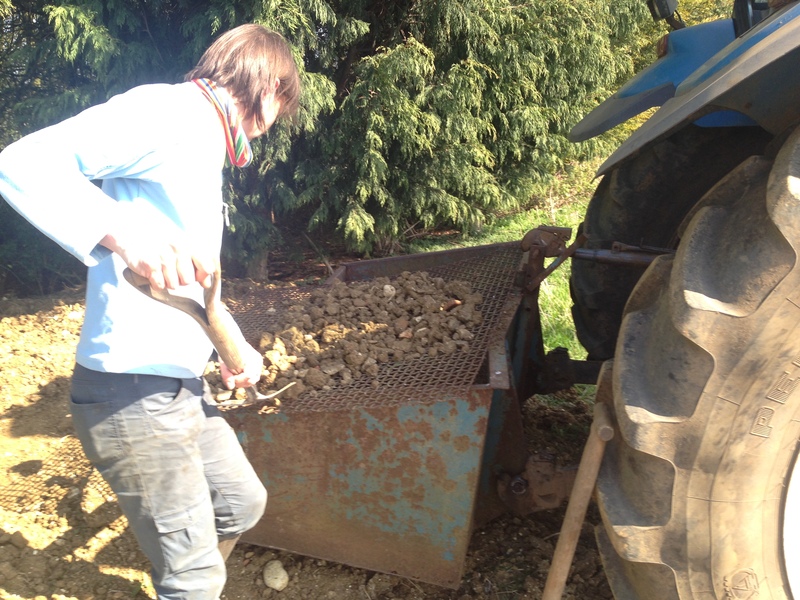 No more tyres and gravel – hoorah! 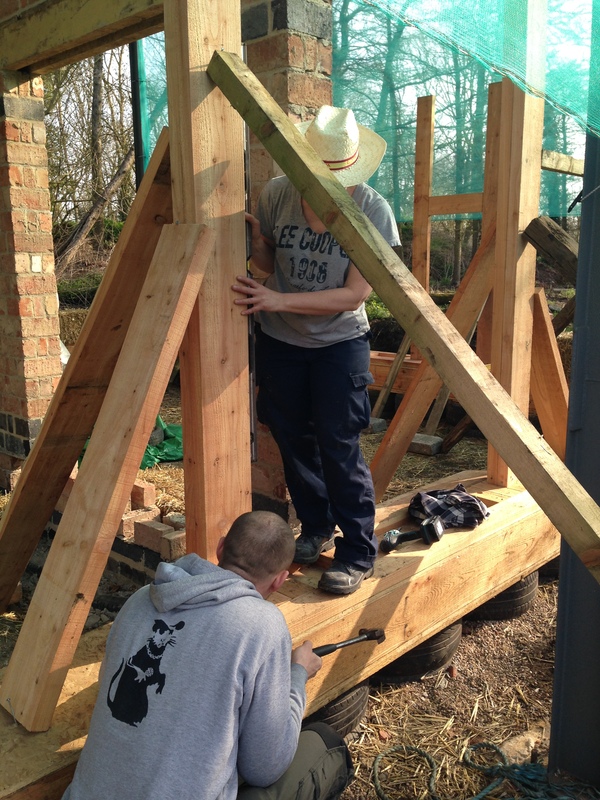 Thanks to Dave and Kev for their hard work on completing the foundations. *this title is borrowed from a particularly puerile comment made by a local councillor on a piece of work myself and some colleagues did looking at the economics of land-use and its effect on environmental services in the fens. He asserted that the British public cannot live “on lunacy and weeds!” I leave it up to you to decide who is right on this….our article is here, his ‘learned’ response is here . This entry was posted in Uncategorized on December 11, 2014 by scampifield.